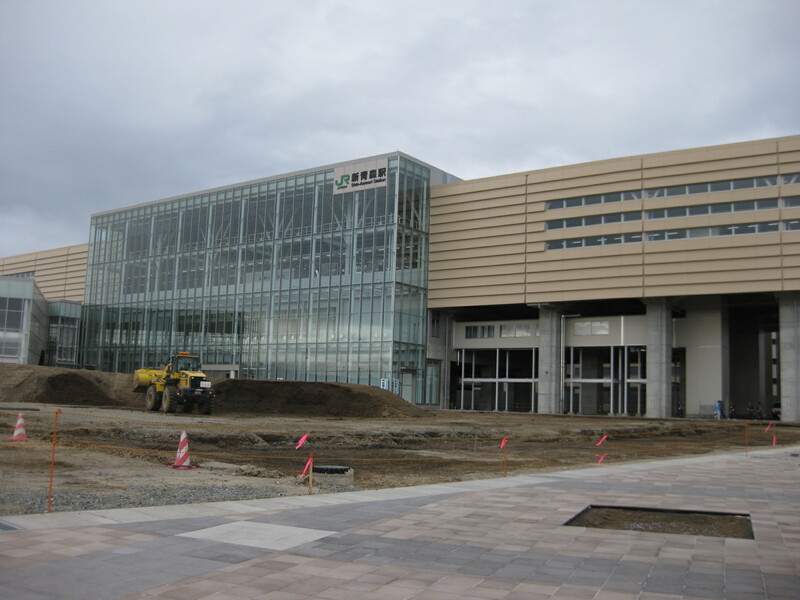 Since the Shinkansen – bullet train is coming to Aomori City in December, the new station is in the course of construction. First 200 public applicants, press people and people in Tourism were invited to the one-day tour on the day of first test run. 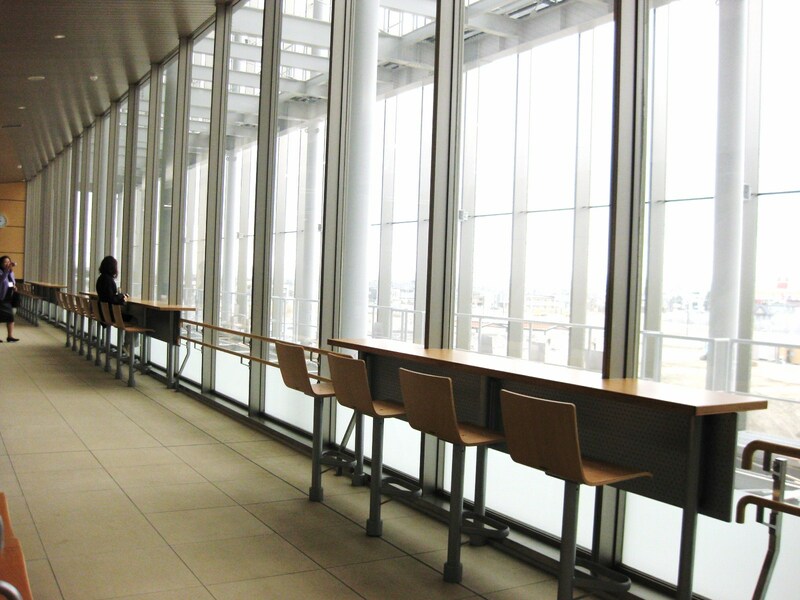 Aomori is a peaceful country, and you do not really find modern buildings. One of my colleagues who went this place with me said “Wow, this is like the building in Tokyo”. I thought that was cute. 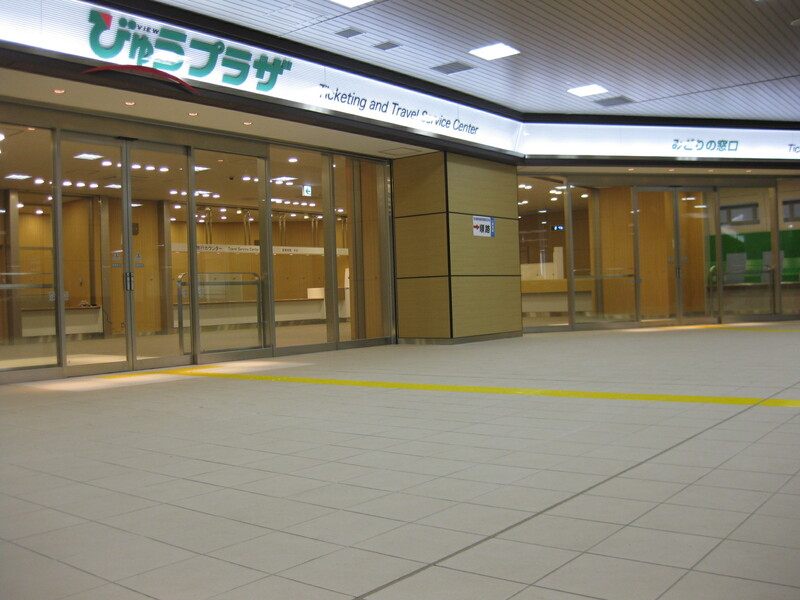 It was fun to see the train station while not completely equipped…..
We could find some materials produced in Aomori in the building. Can you tell from the following pictures? Q1 What are these red bars made of ? 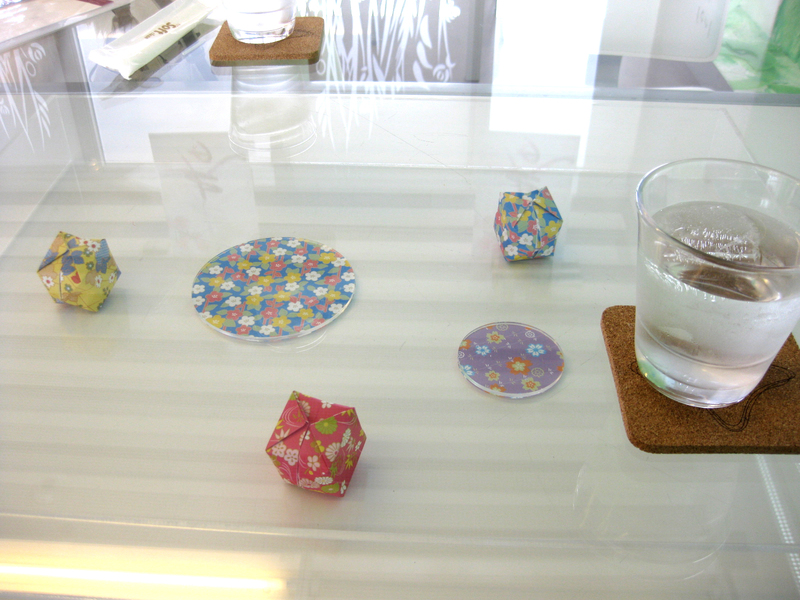 A1 is Tsugaru Lacquerware. 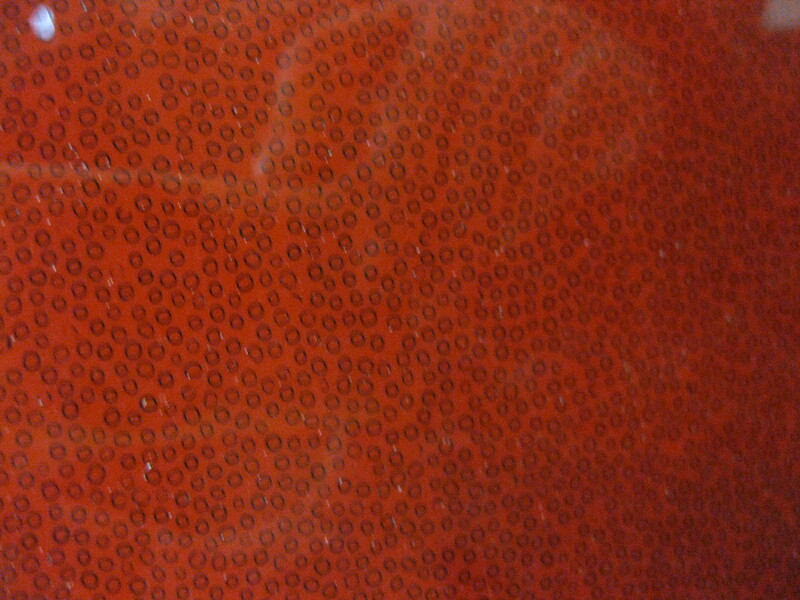 This is called Nanako, one of four types of lacquer patterning in Tsugaru Lacquerware. 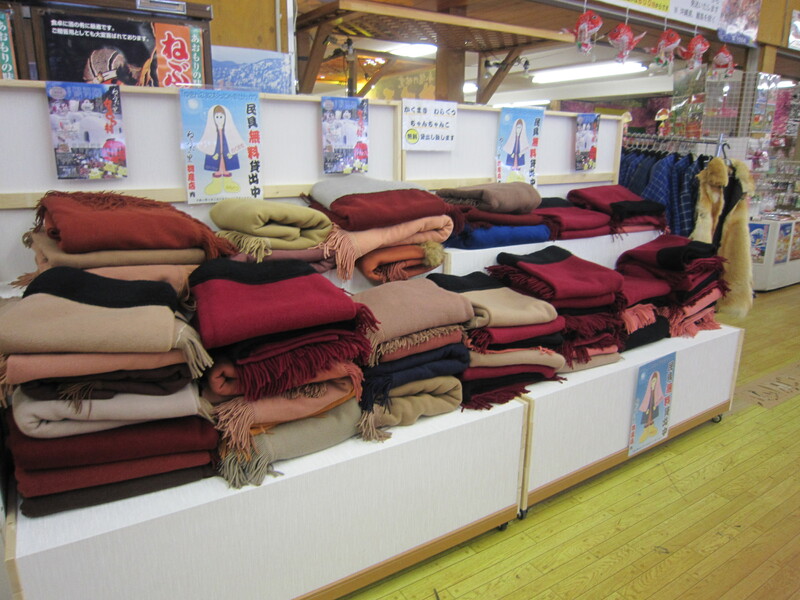 People who found the Nanako on the pillars were saying “Oh…luxury pillars”. 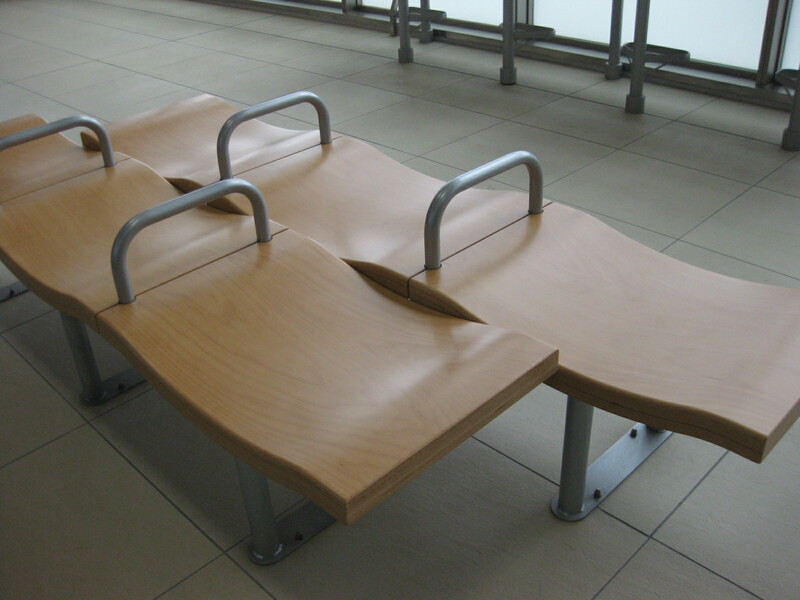 Q2 Can you guess what kind of wood was used to make the bench chairs? 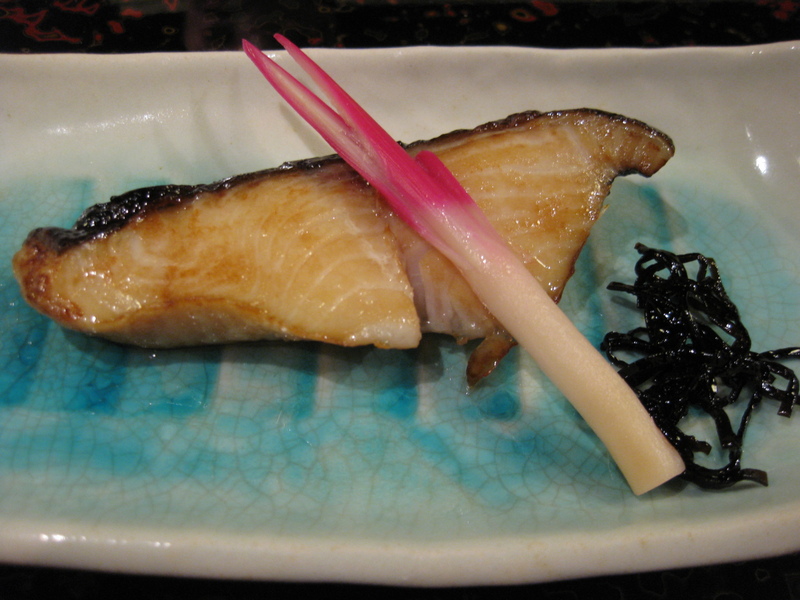 A2 is Aomori Hiba Cypress, which is aromatic, durable and has beautiful grains. 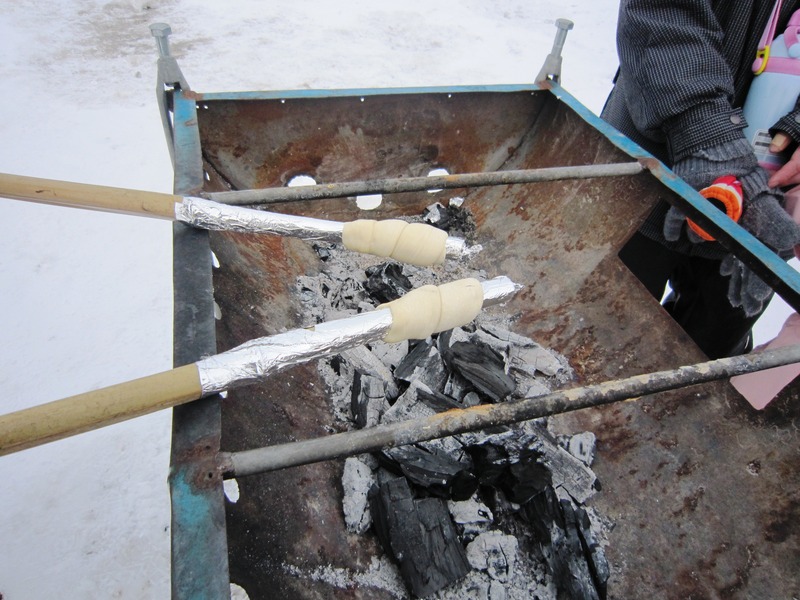 It is popular to make furniture, bath tubs and wood crafts. 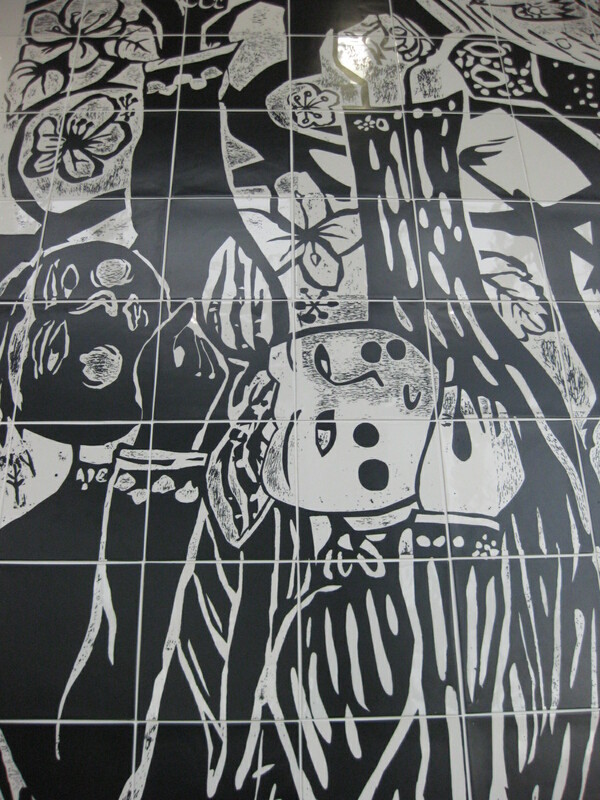 Q3 Who influences Aomori people on printmaking? 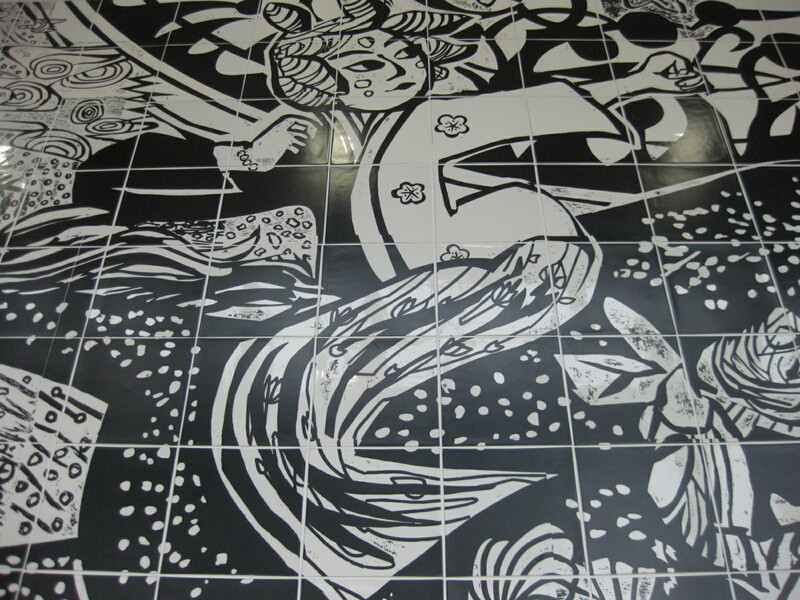 A3 is Munakata Shiko – a famous printmaker who was born in Aomori-City. Please enjoy Christy’s previous entry on A Glimse into Aomori’s artsy side-Munakata Shiko for more information about him. 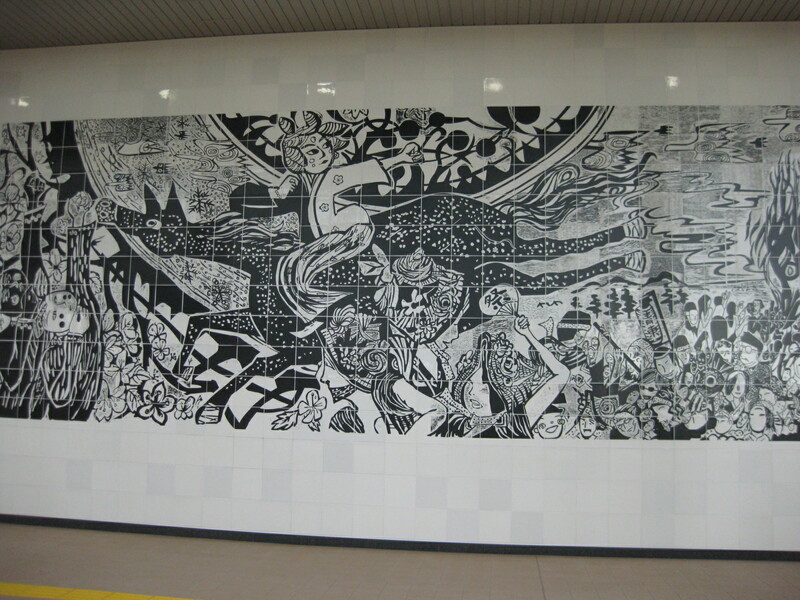 The original of this huge work was made by 242 groups of Aomori citizens in 2003 to celebrate Munakata’s 100th anniversary. 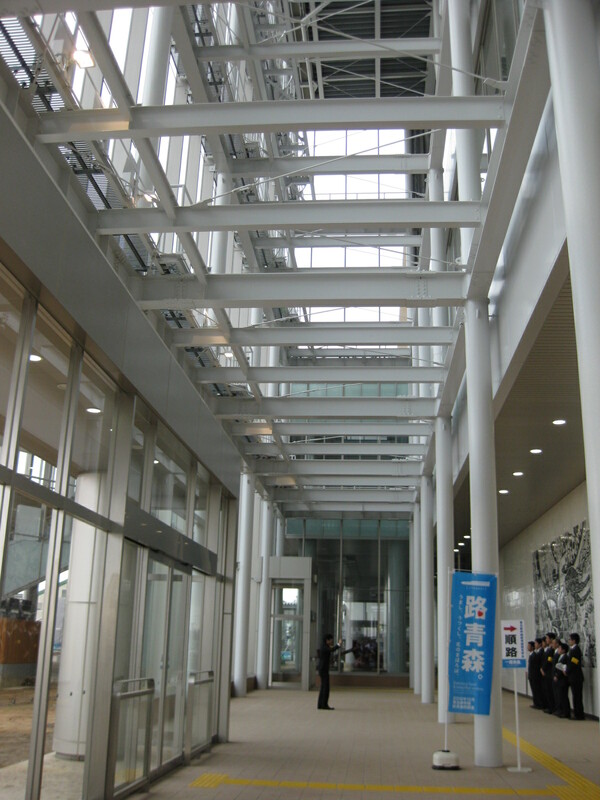 The platform is on the 2nd floor. 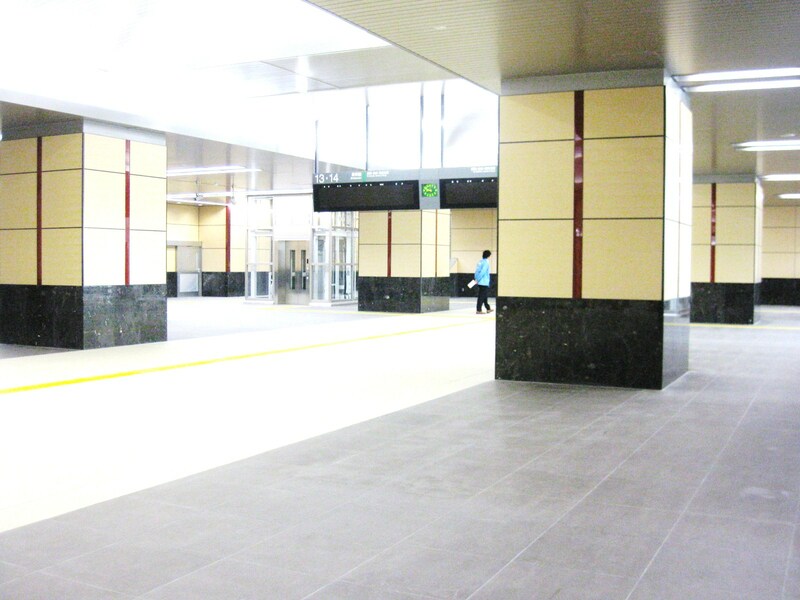 This station will be the terminal of Tohoku Shinkansen in Honshu Island. 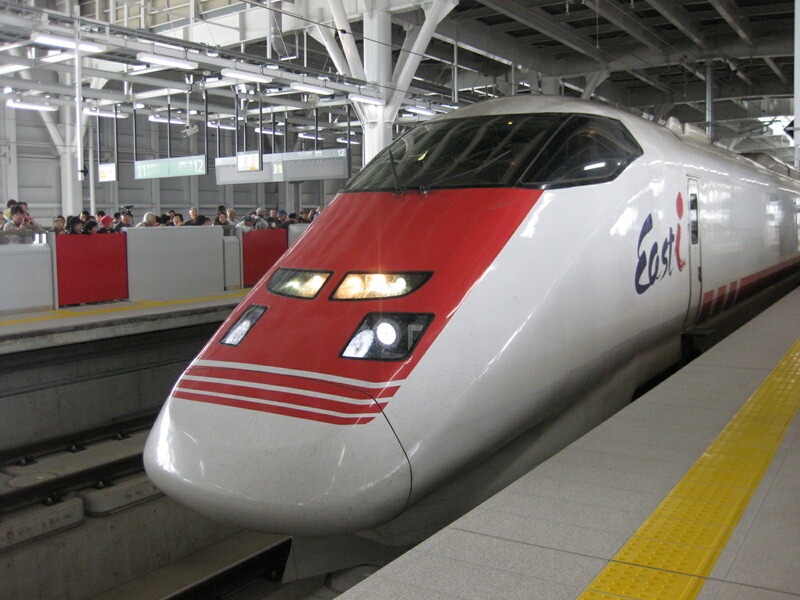 Then it is to be connected with Hokkaido Shinkansen rail line in about 5 years. 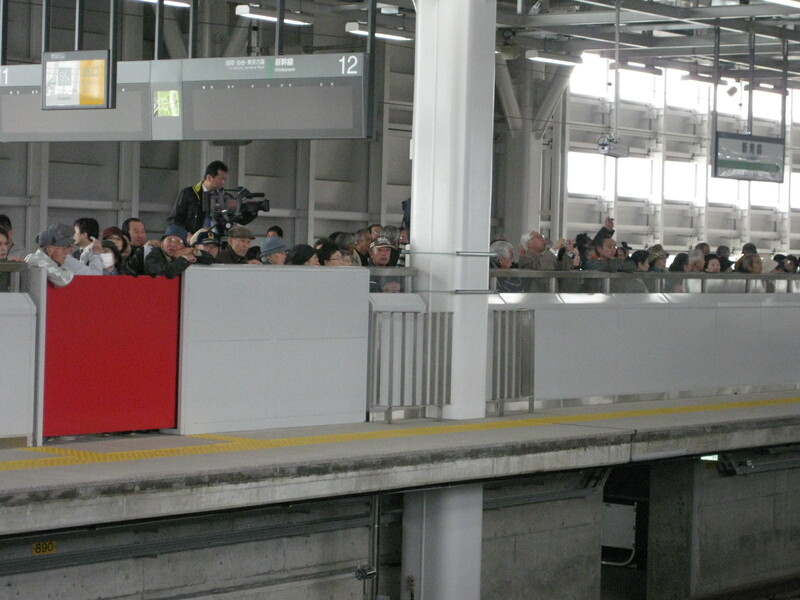 I heard about 600 people got together to welcome the first train coming to this station. Suddenly the Nebuta festival live music started, which was a signal of the train arrival, and all people got ready to take pictures and filming the train. 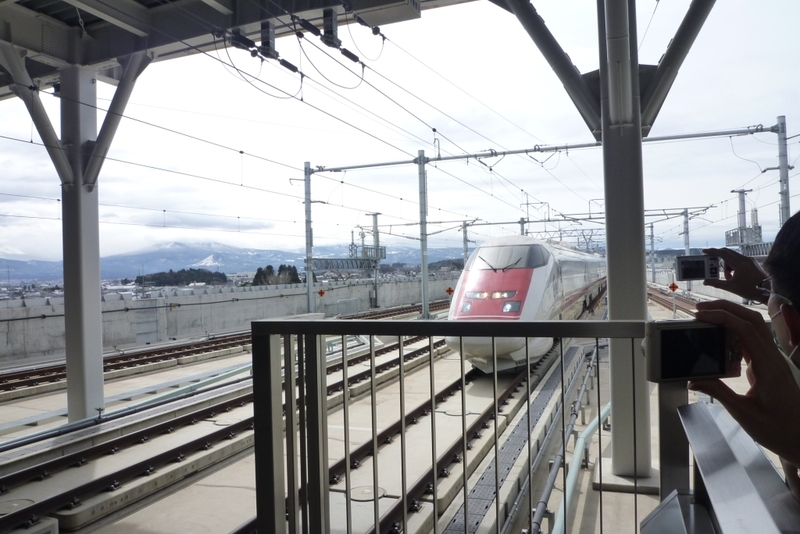 The inspection train “East i” which is equipped with all the measuring device and inspection apparatus left Hachinohe Station at 2:00am, kept running 30km/h and arrived at this station at 9:49am. 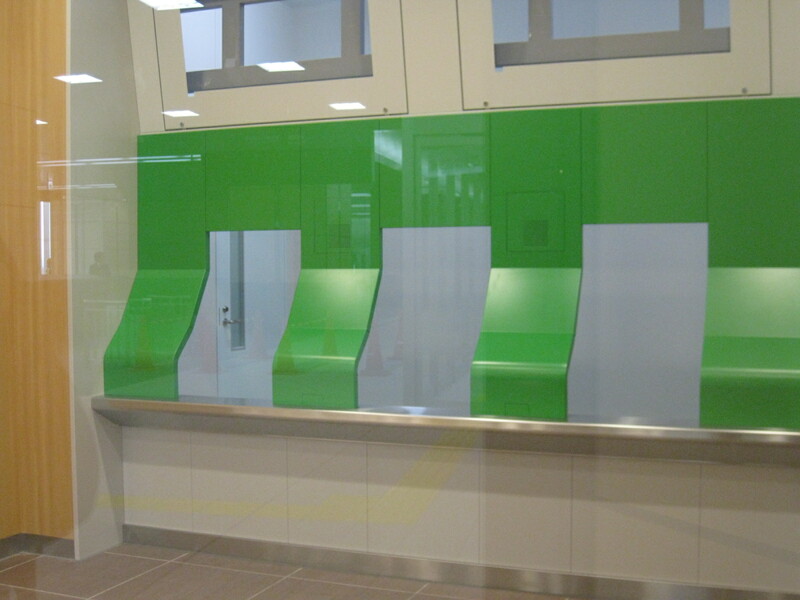 Gradually test speed will get faster and final test run will be 260km/h as the maximum speed in the end of June. Amazing! 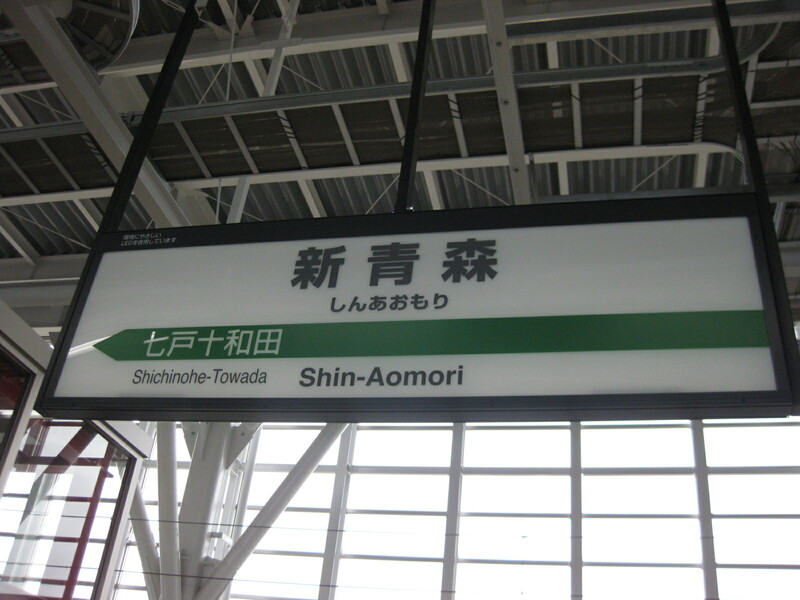 By Shinkansen it will take only 3 hours and 10 minutes from Tokyo to Aomori-city from December 2010. 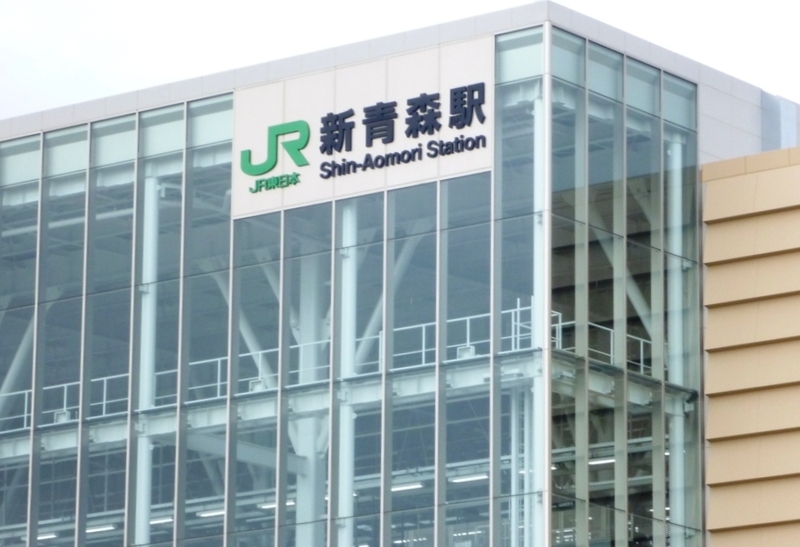 Those who will hold Japan Rail Pass while staying in Japan, please do not fail to visit Aomori!!! 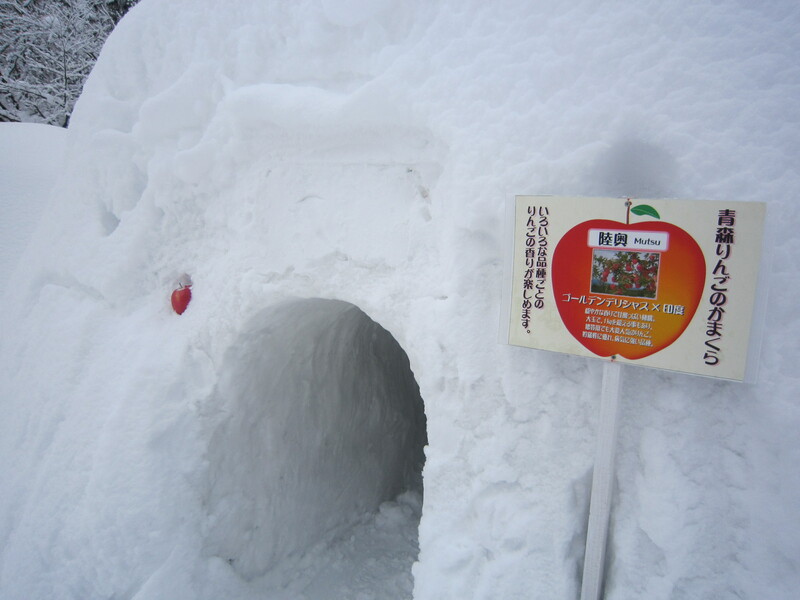 Namioka area is known with producing tasty apples, and this peaceful apple farm town didn’t have any particular shops or restaurants which attract younger generation…..until this cafe opened. 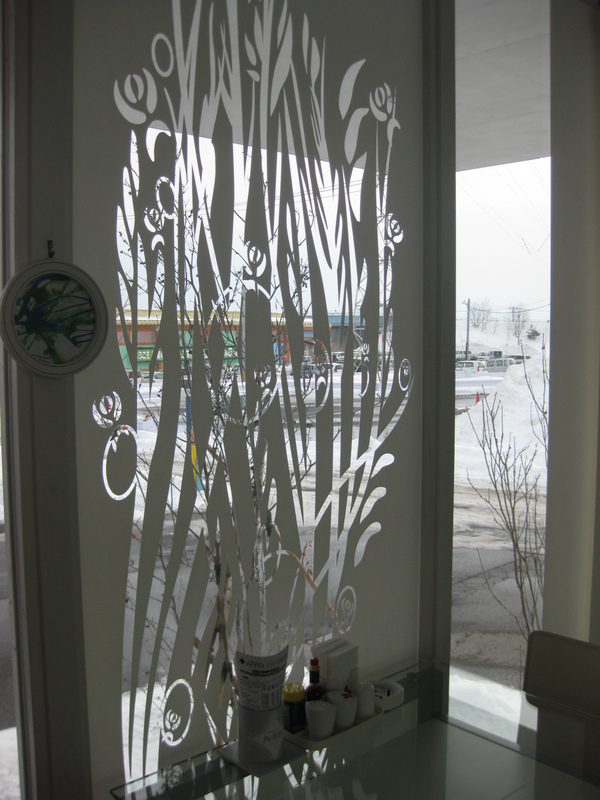 This shop & cafe is located along the national road, Route 7 and I enjoy lunch here on the way going to Hirosaki-city from Aomori-city. In the picture above, can you see something small and yellow on the right? I found a poisonous mushroom in the snow. Cute. 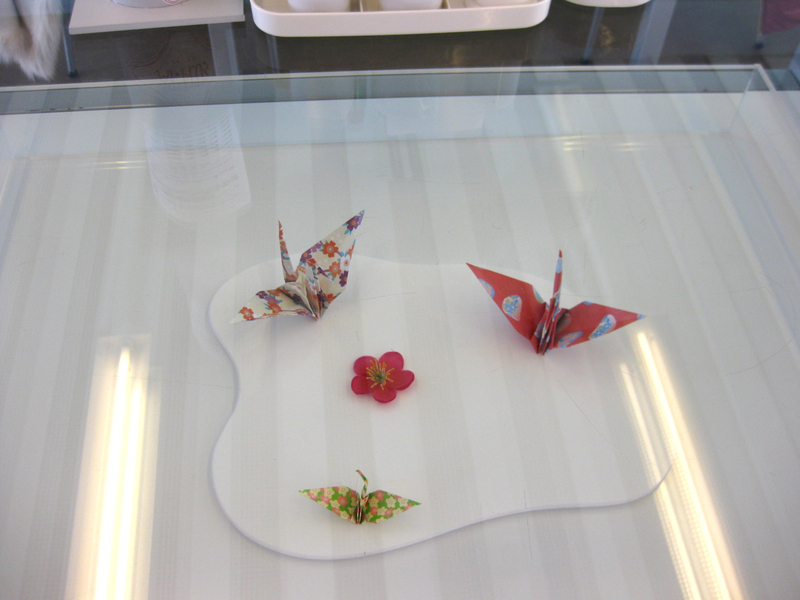 The signboard design company runs this cafe, and occasionally rearrange the art display according to the season. 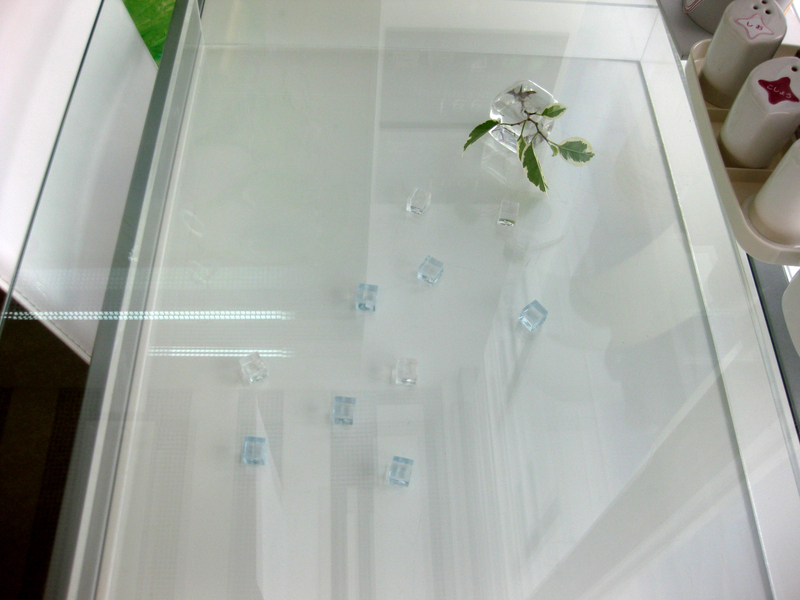 The tables are made like the jewelry showcase, and small cute items are displayed with seasonal theme in each table. I believe food is like a mirror of the cook. When cooks are in the bad mood, or hate their job, you can feel it. 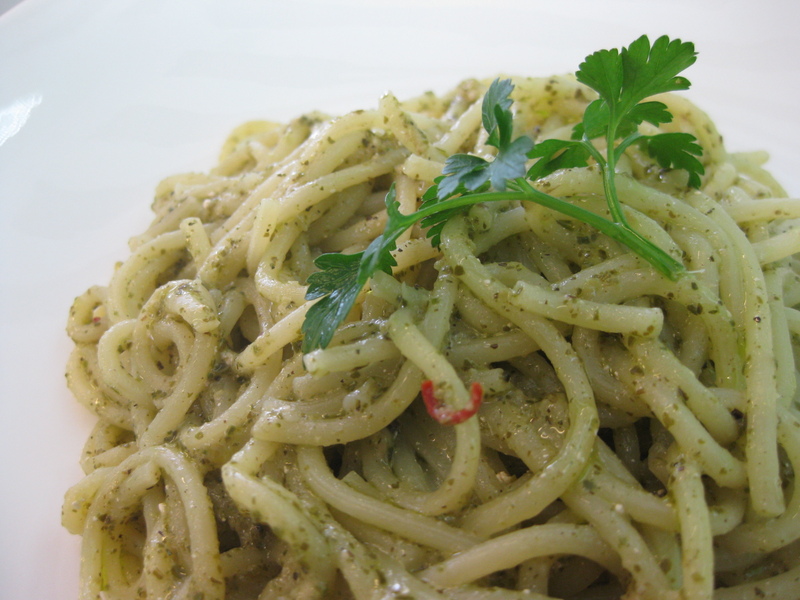 Pictures can also tell you when the served foods are lifeless, they don’t look tasty. 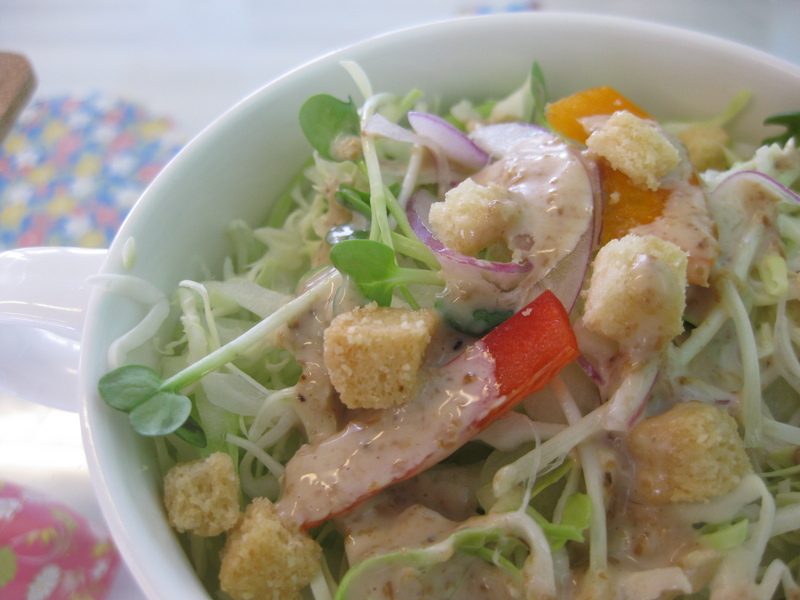 One more increadible generous part in this cafe is, all drinks become 150yen for visitors ordering lunch set. 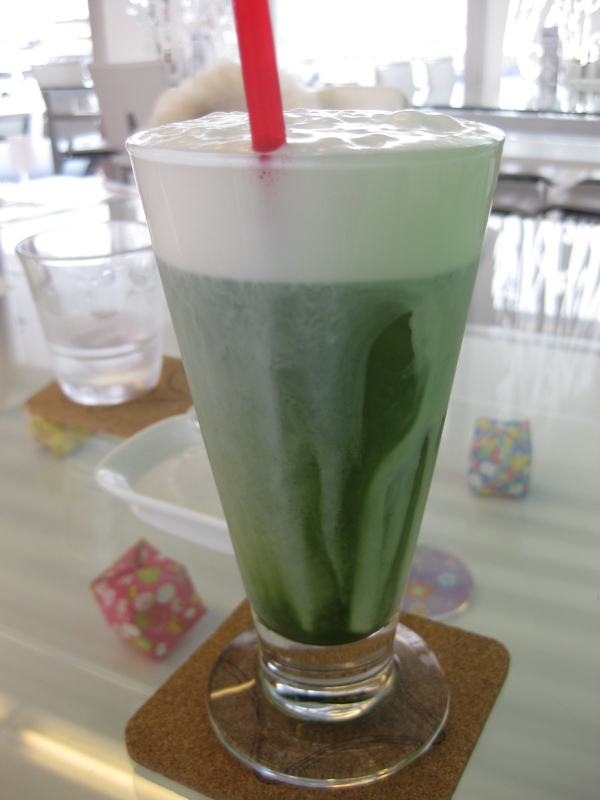 So I had “Maccha Iced Latte”, one of the most expensive drinks in the menu (haha), which was using real maccha and milk foam. !Que Fantastica! FYI this cafe serves “Illy” espresso. 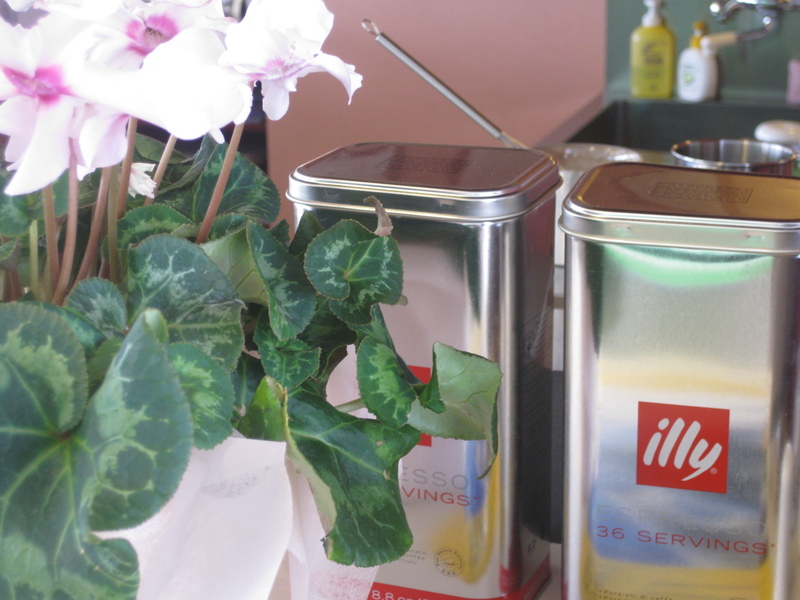 You can buy Illy coffee powder at the imported food stores in Aomori, but there are not many cafes serving “buonissimo” espresso around Aomori city. 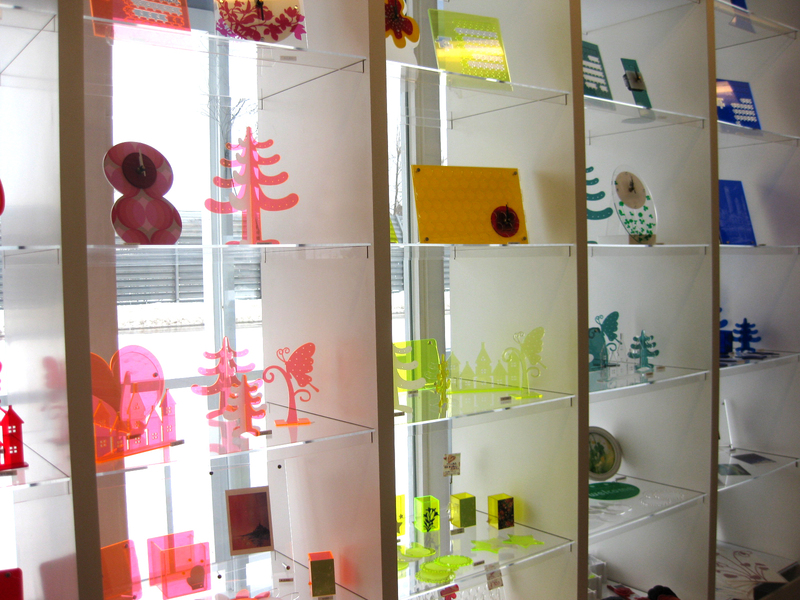 Before or after enjoying food and drinks, you can look around the shop area which has many products including original acrylic products. 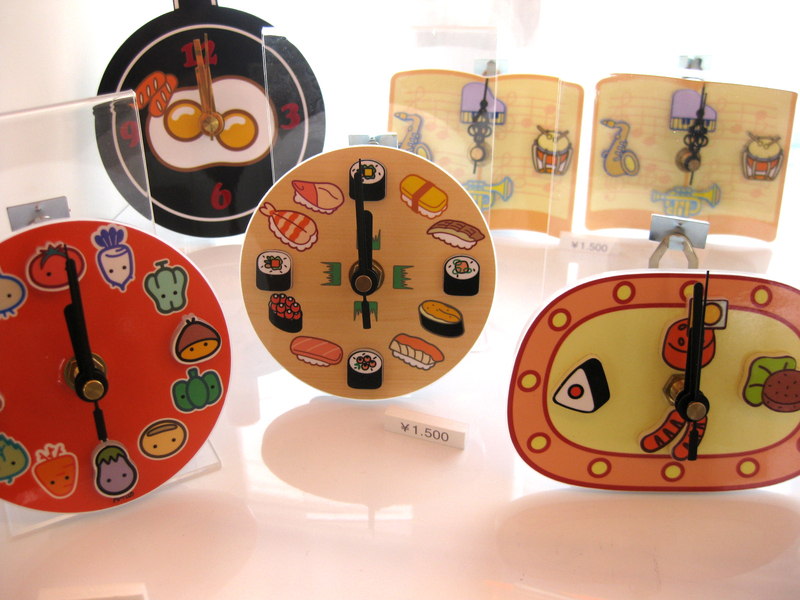 My personal favorite is Sushi clock in the middle of the picture below. 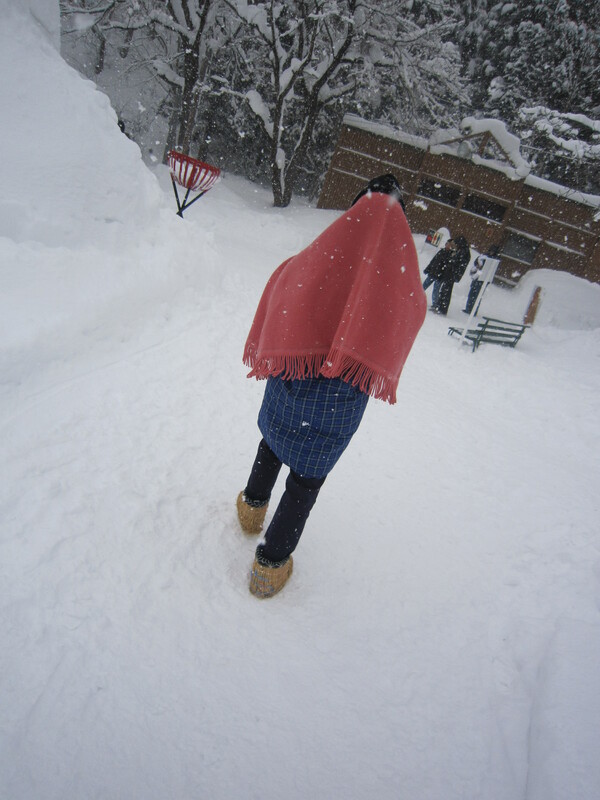 Spending long winter in Aomori-city is never easy. Heavy snow, grey sky and icy roads like a skating rink always get me down. 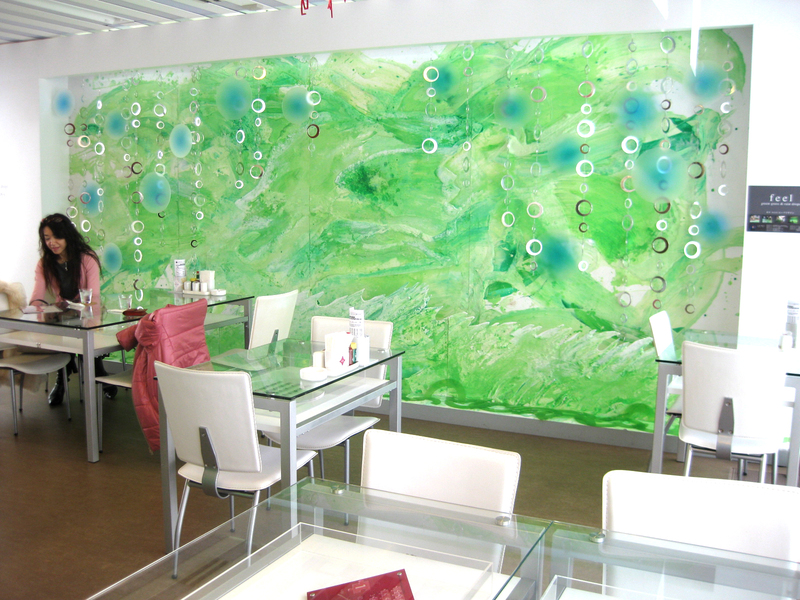 This cafe, having happy and peaceful atmosphere helps me to escape from reality for a while. 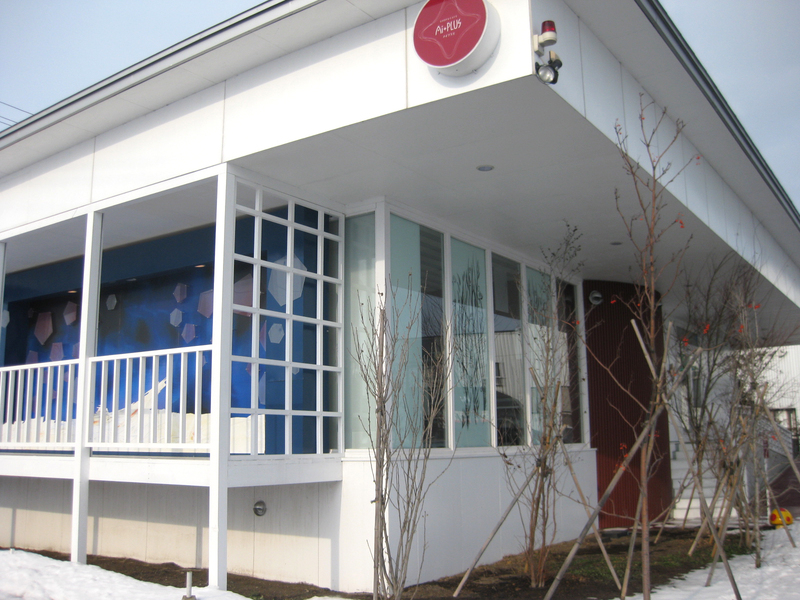 I’ve never been to this cafe by train, but the map shows it is only 5 min walk from JR Namioka Sta. 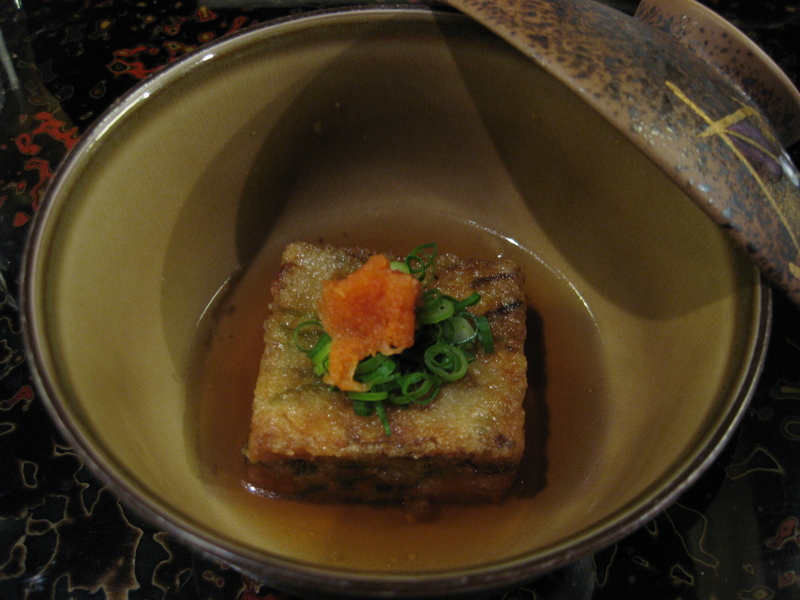 The menu is written in Japanese and also in Enligsh with many pics. 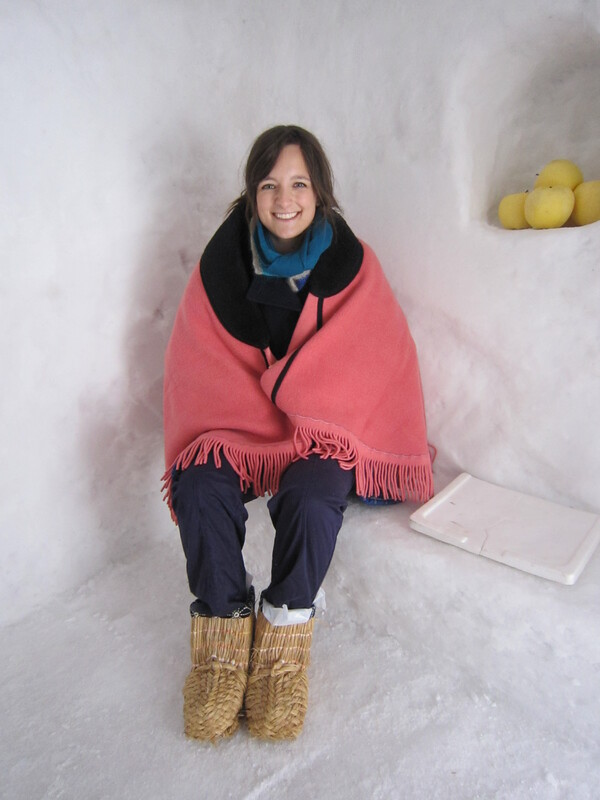 So I think foreign visitors don’t have to hesitate visiting here at all. I heard waffles and Hamburg with various sauce choice including Miso sauce are delicious too. Please visit there and let me know if you liked them. By Car: Approx. 2km from Apple Hill(rest area) From Apple Hill, go straight toward Hirosaki-city, and you’ll find the white building with a burgandy signboard on the left side. 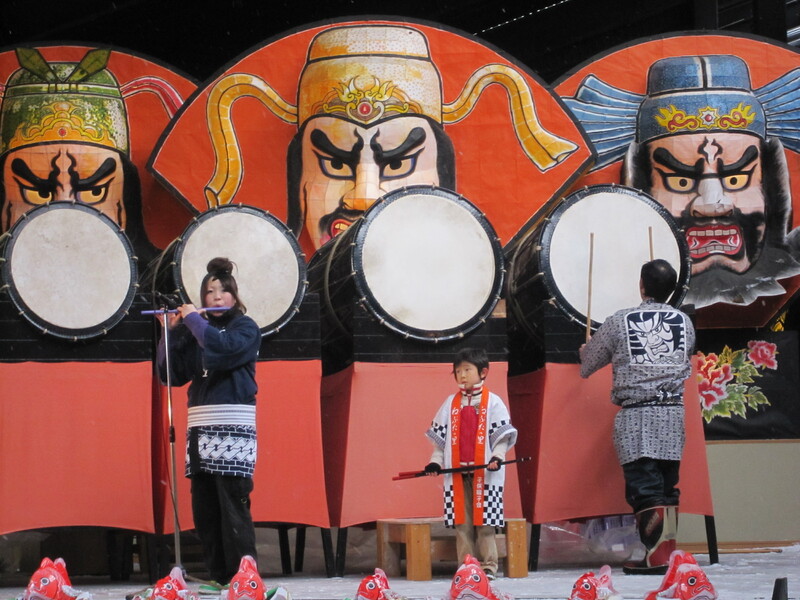 As I am sure many of you have heard, Aomori is famous for its Nebuta Festival. However, since it only lasts for one short week in August, it may be hard to catch. For those of you that miss it, there is a great attraction called “Nebuta no sato” (The village of Nebuta), located near Moya Hills in Aomori City. 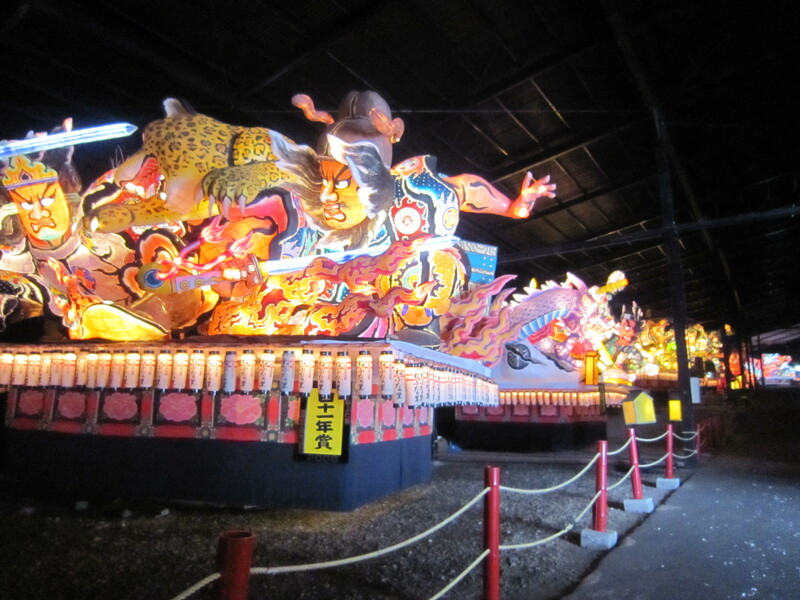 Is open year-round and offers a great chance to experience Nebuta. 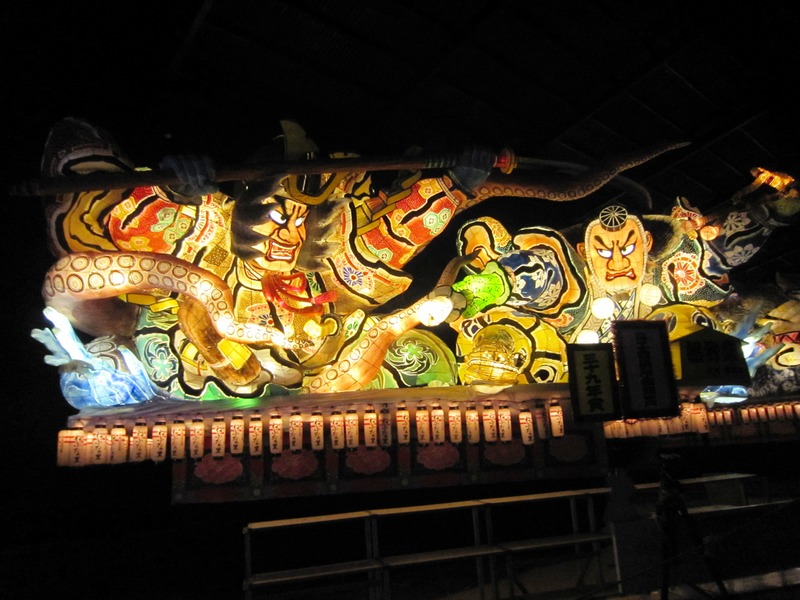 There are several Nebuta floats on display. 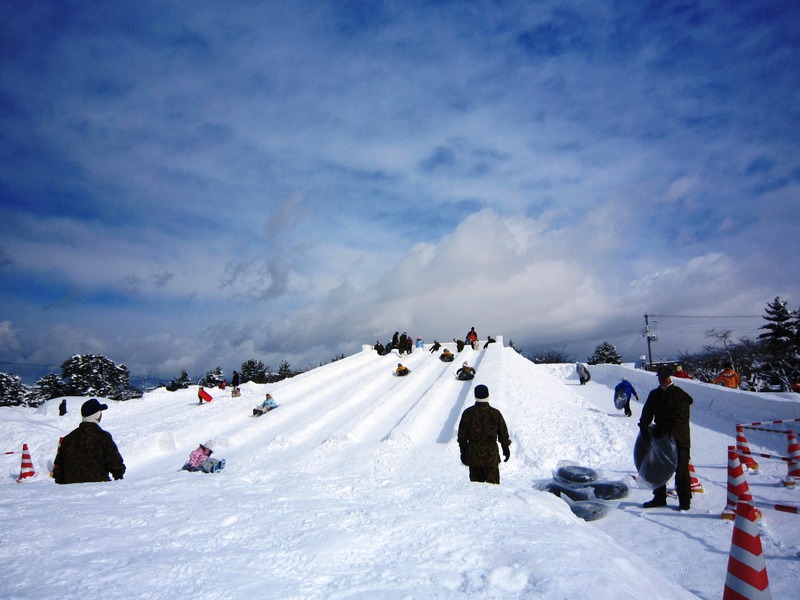 You can also experience dressing up in a Nebuta costume, dancing, or even pulling a float. It’s the true package! 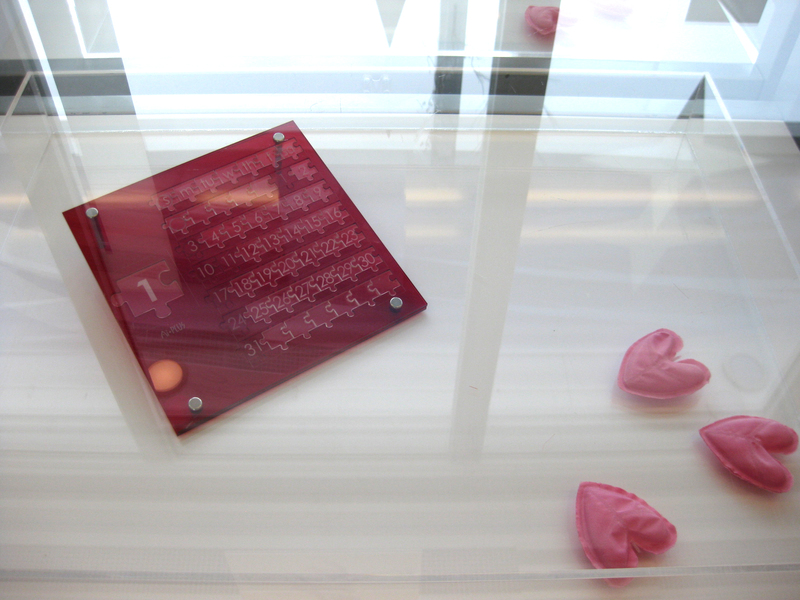 Now, if you are lucky enough to be visiting in January or Feburary – there is still one more treasure to be revealed. 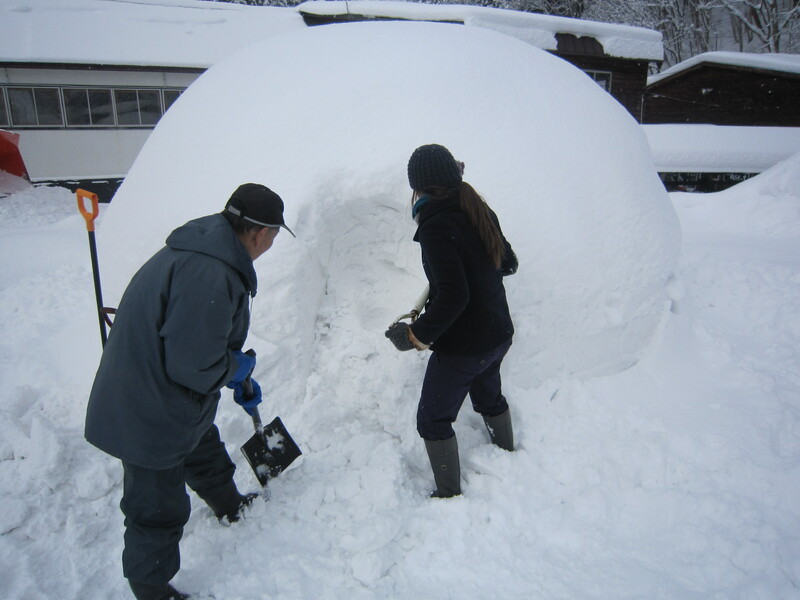 Yes, that’s right folks, in the winter months Nebuta no sato sets up an area with igloos for visitors to enjoy. 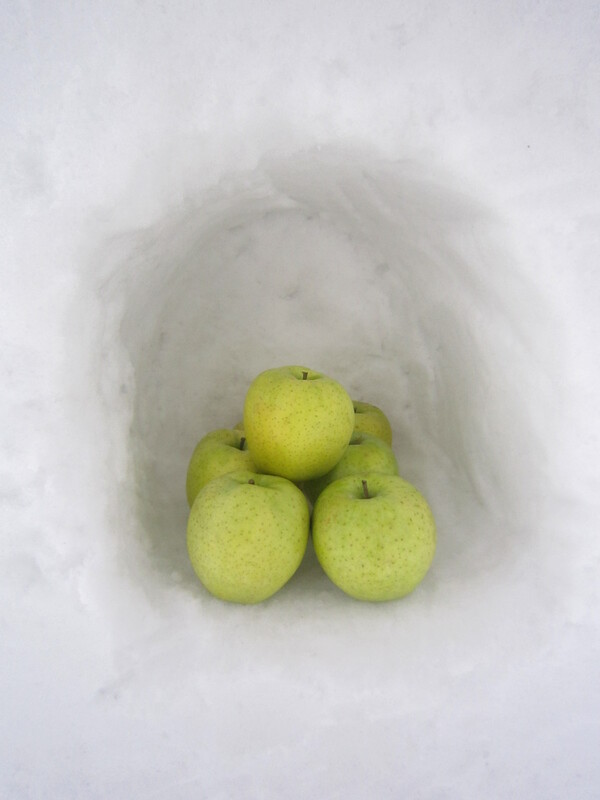 Each igloo is based around a certain kind of apple. 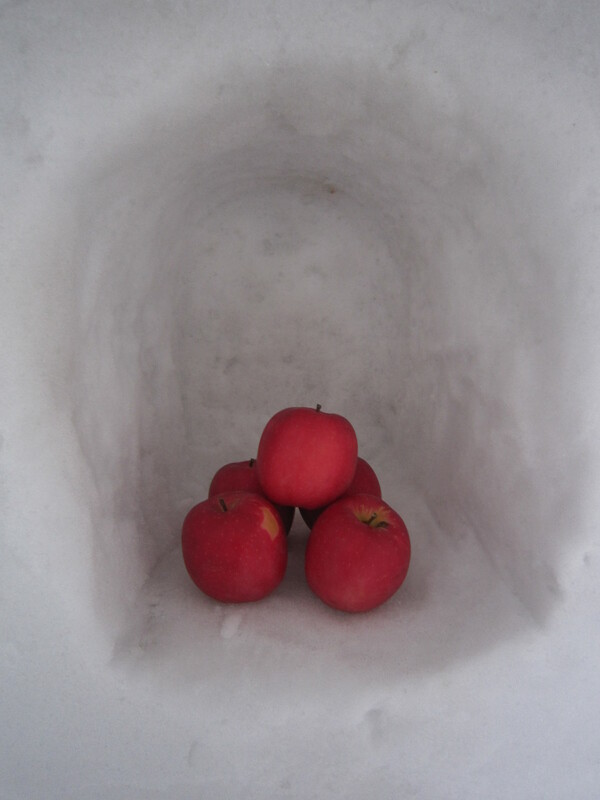 It’s fun going around to all of the igloos and checking out the different kinds of apples. 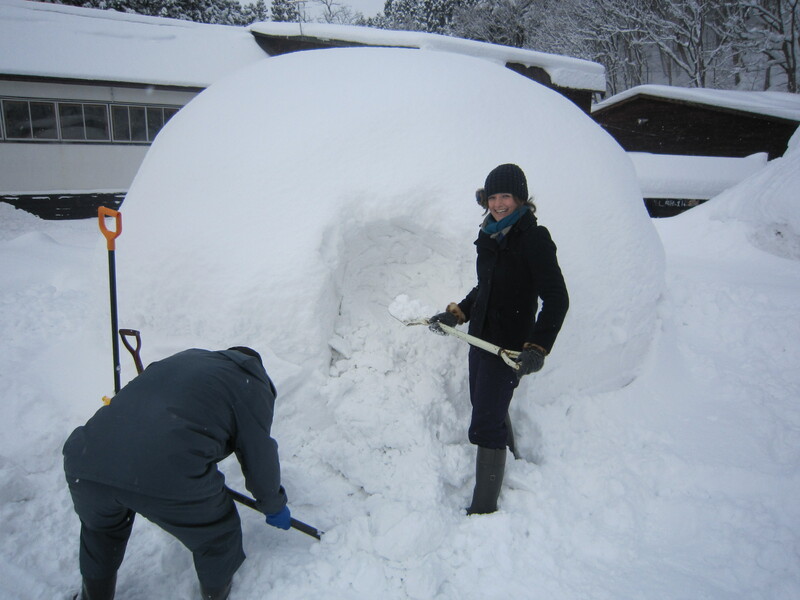 However, beware – you might be roped into helping dig some of the unfinished igloos! The snow was almost like ice, we didn’t get very far. This little old man told me it would take about 2 hours to carve out the entrance. 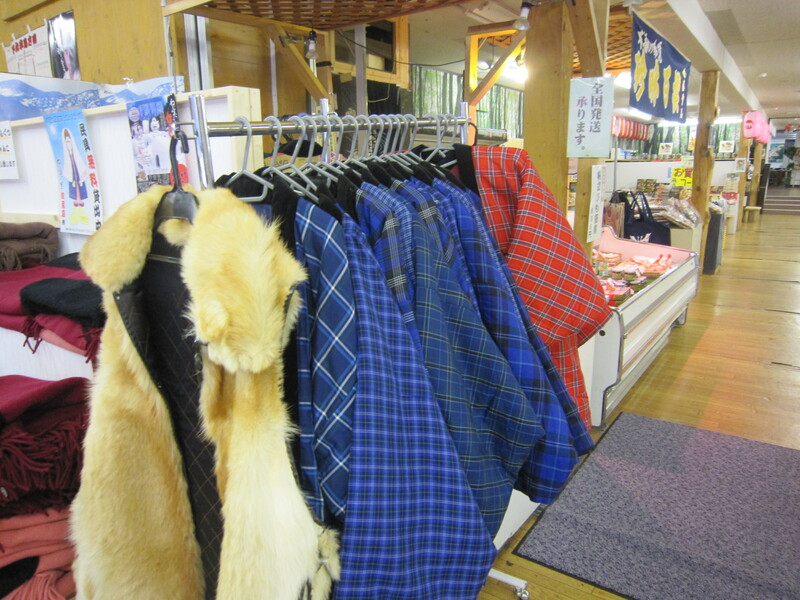 Before you head home though, don’t forget to try out some old traditional winter wear. Nebuta no sato lets visitors borrow tranditional Japanese clothing. It’s quite fun! Here is the first item. 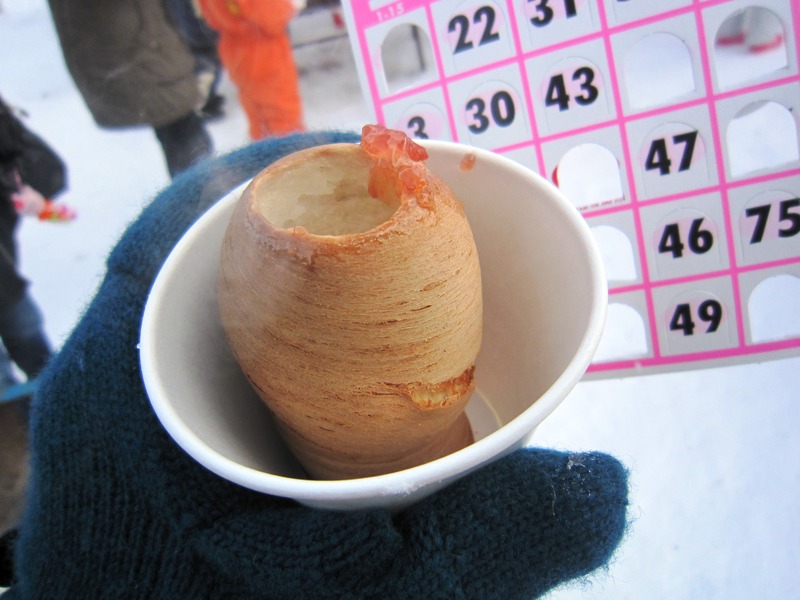 In Japanese its called a “chanchanko” also know as a “hancha” in Tsugaru dialect. It’s basically a nice warm vest. 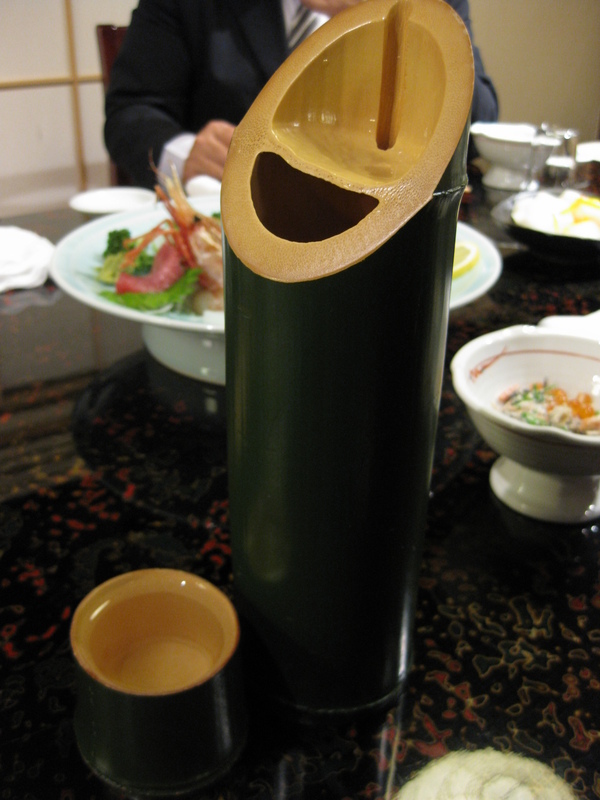 Over the “chanchanko” goes a shall, known as a “kakumaki”. You can wear it on your shoulders or over your head if it’s snowing. 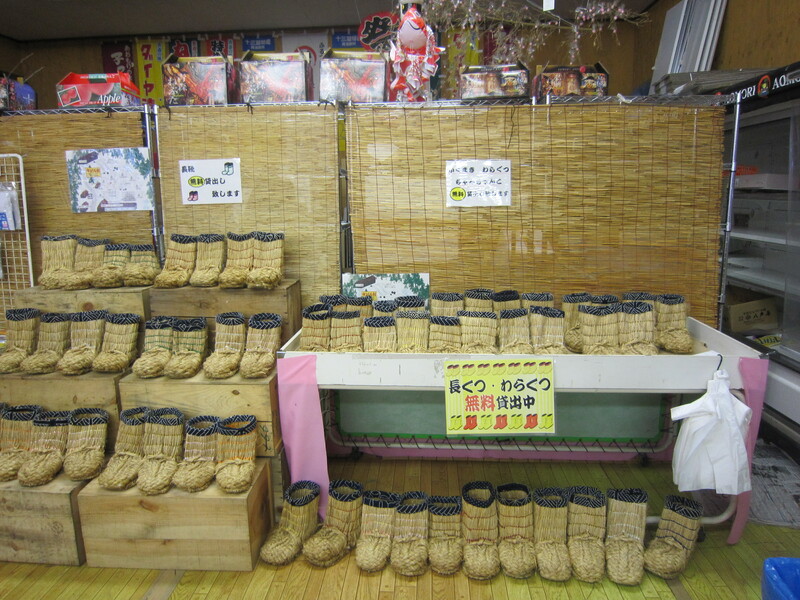 And last but not least, straw boots. 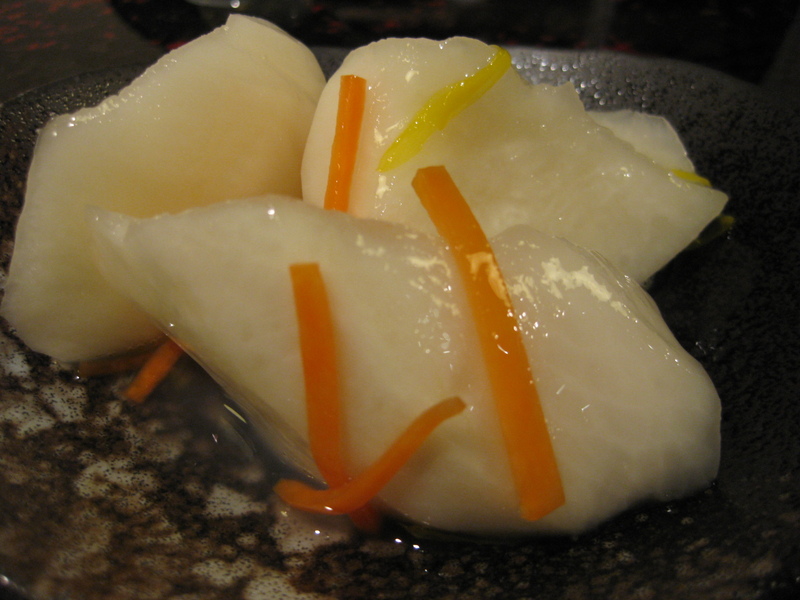 They are known as “warakutsu” in Japanese. I was actually surprised, they were quite comfortable for walking! 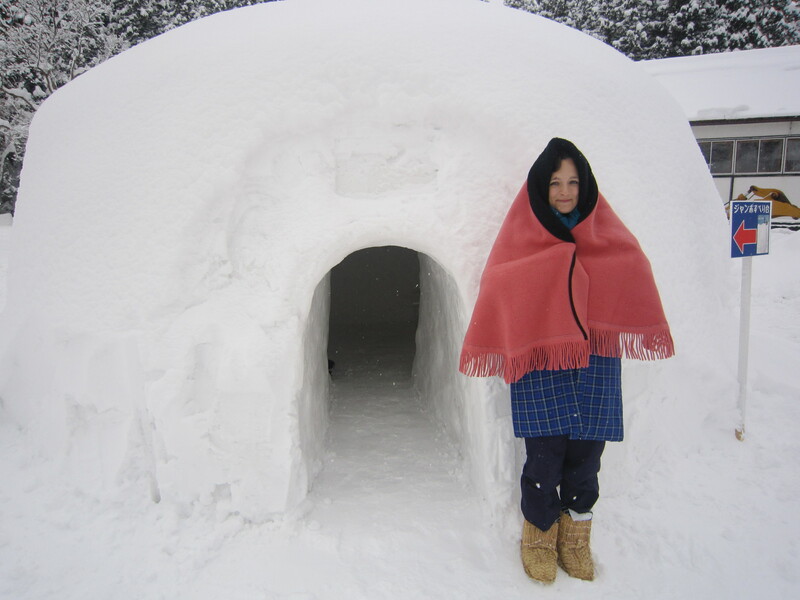 After getting dressed Japanese style, back out to the igloos! If you get a chance I highly recommed visiting Nebuta no sato at this time of year. 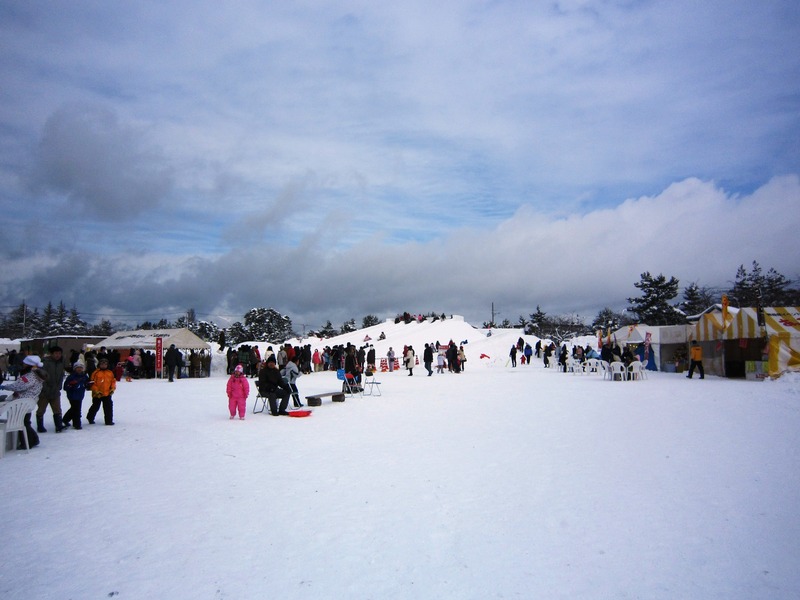 It’s great winter fun! 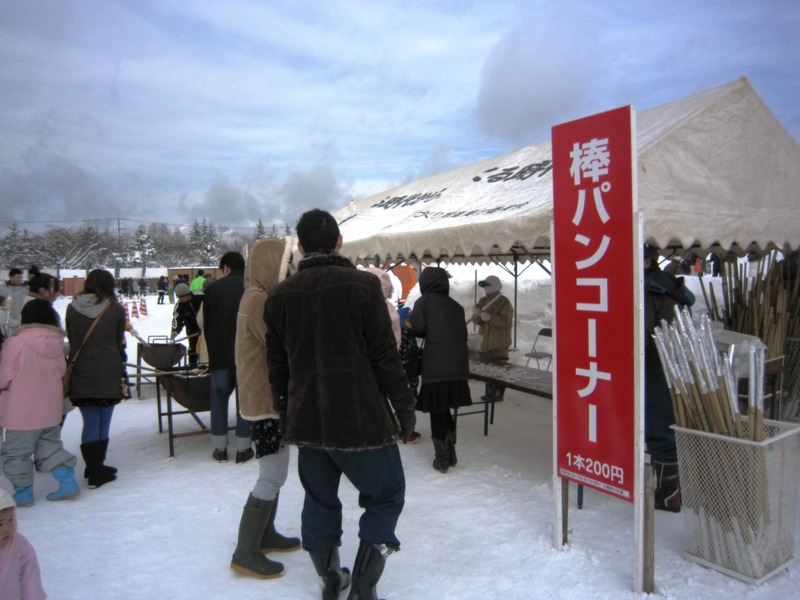 Udon, thick white noodles made from wheat are very popular food Japanese people enjoy eating all seasons but especially in winter. Aomori doesn’t really have authentic Udon culture, but Kagawa (in Shikoku Island) people are so very picky and serious about Udon. 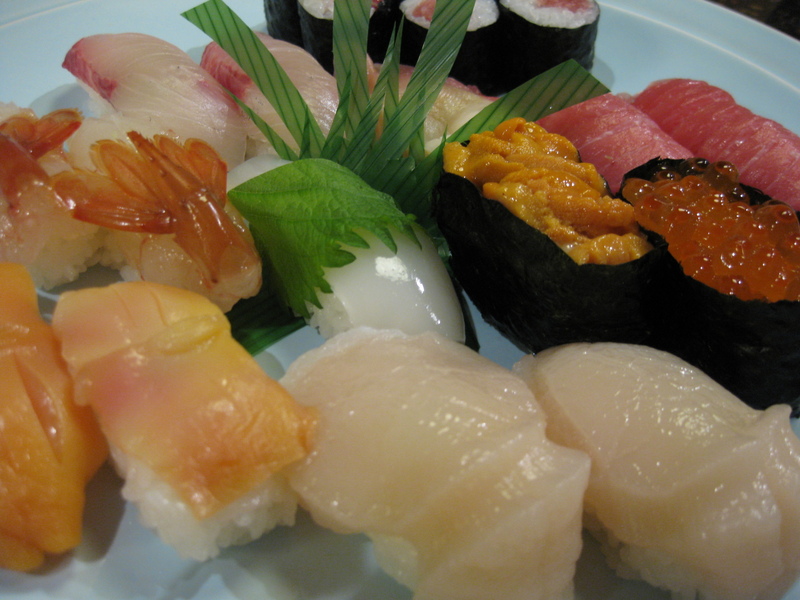 I used to work with a boss who was from Kagawa-ken(prefecture). 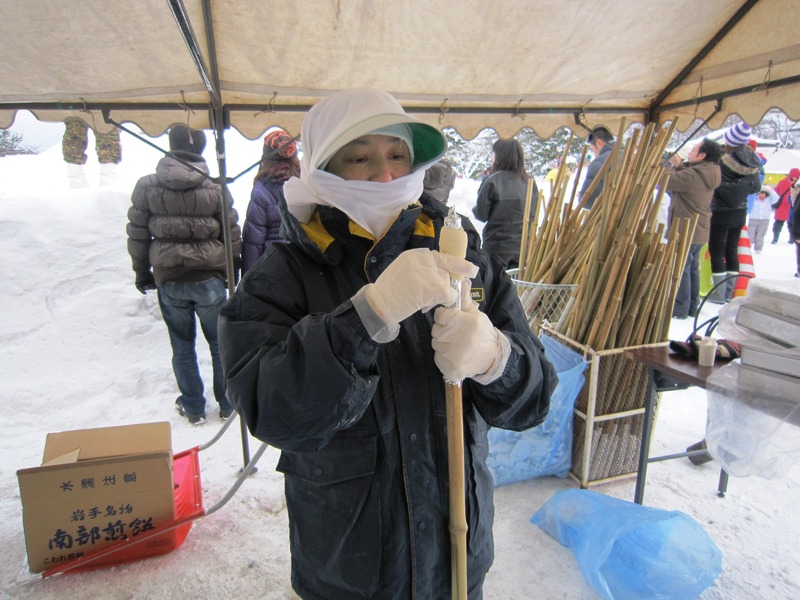 He always wanted to eat Udon, and my co-worker introduced some restaurants in Aomori-City. After my boss went to 5 or 6 Udon restaurants, he said “I don’t think I’ve ever had any noodles I call Udon in Aomori” with heavy irony. 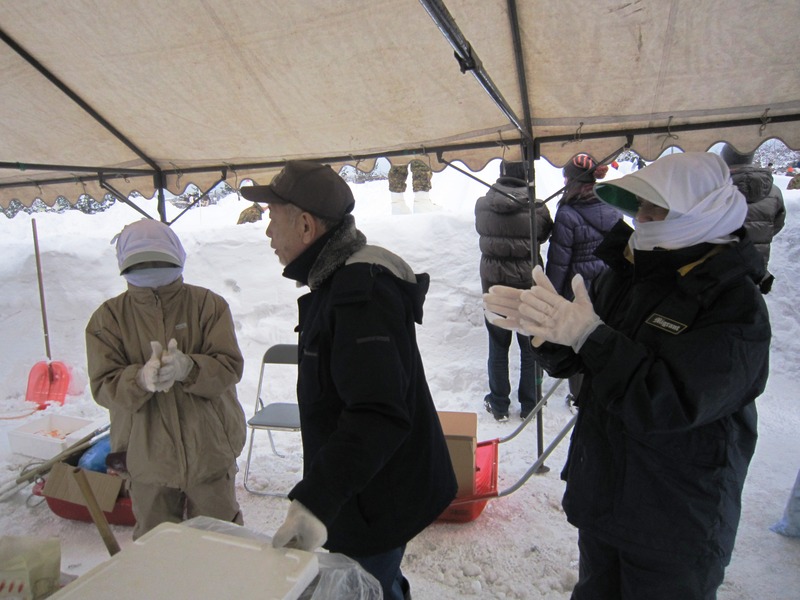 Until recently, people in Aomori were not aware of the difference between Udon we usually buy from supermarkets and Sanuki(old name of Kagawa) Udon which people in Kagawa eat. 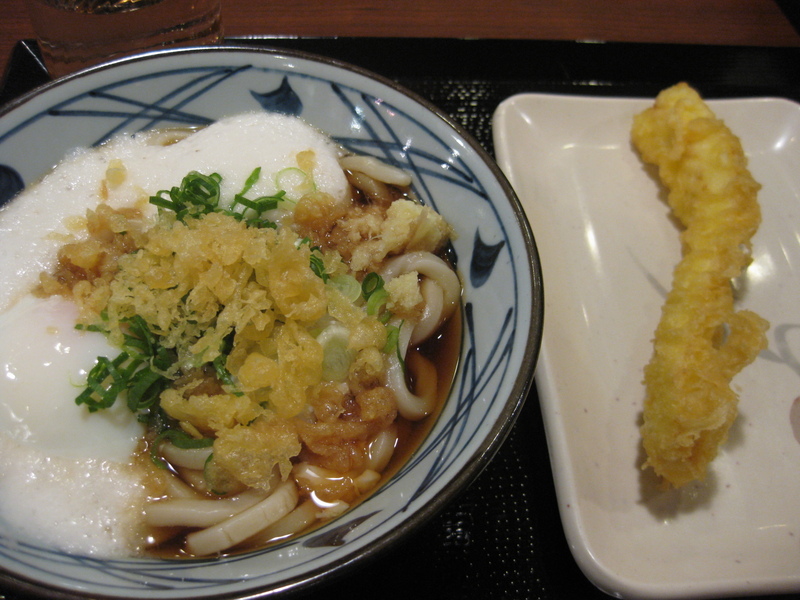 I actually had Sanuki Udon about 5 years ago when I traveled around west area of Japan. 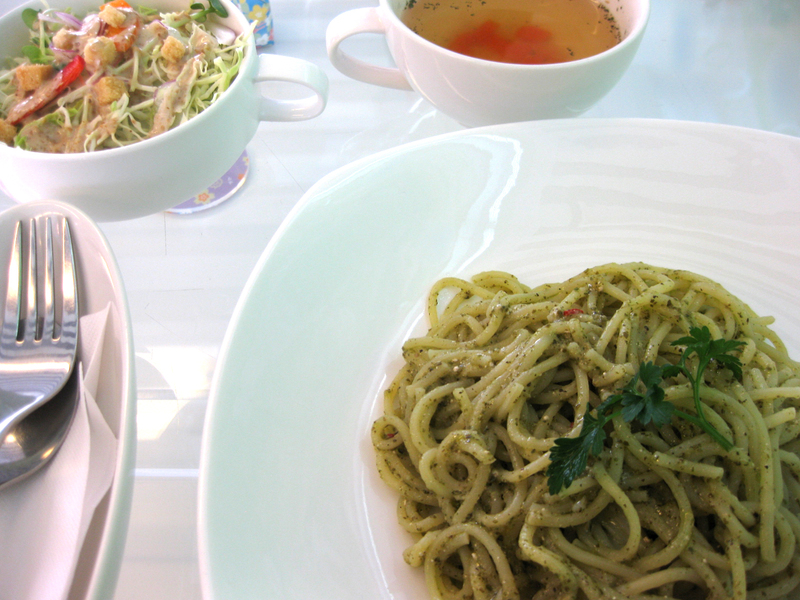 It was SO DELICIOUS with firm but chewy texture…totally different from what I thought was Udon in my life. Since then I’ve been a big fan of Sanuki Udon. 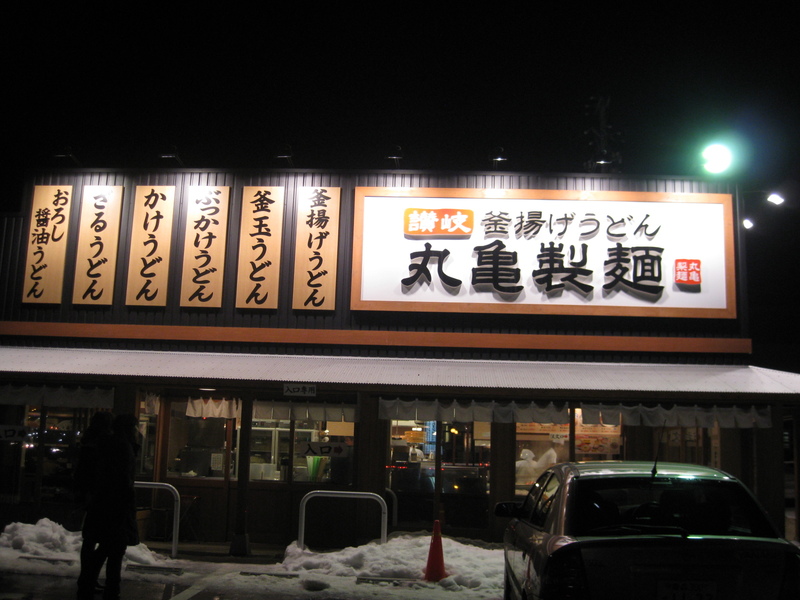 BTW this blog aims to introduce something charming and typical about Aomori, and I know introducing Sanuki Udon “chain” restaurant is not really cool. 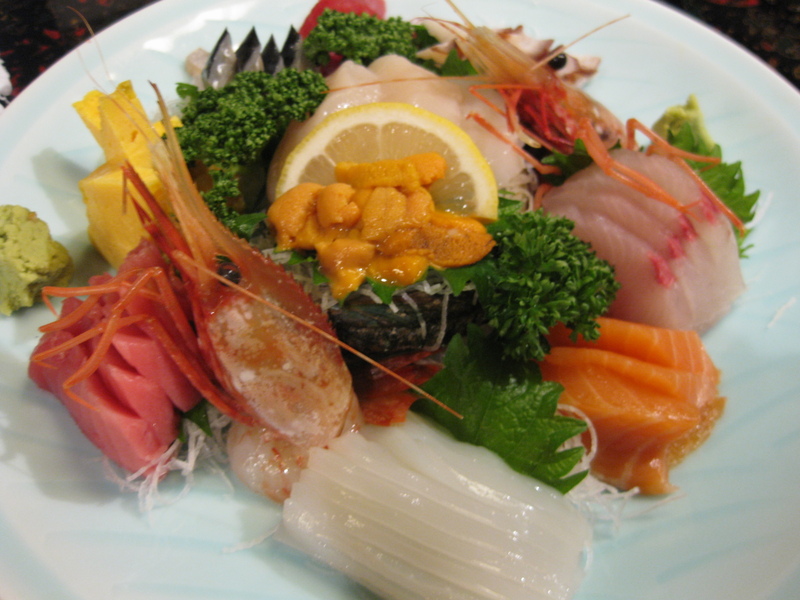 But I wanted to give the future foreign visitors to Aomori or Japan the idea of going to the reasonable Udon restaurants which should be better than going to the world’s largest hamburger chain to save the food expenses…. This is a new restaurant opened 2 months ago. 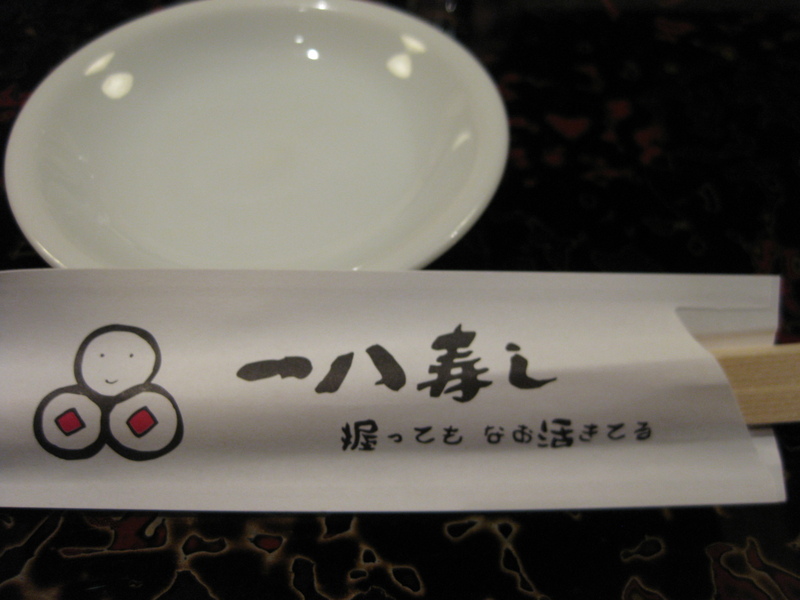 I checked the website and there were 321 chains of this Udon restaurant all over Japan. This place is run on the cafeteria principle. First you order Udon, (choosing helping size, hot/cold, with broth or not etc..) then you can pick some options of various veggies or seafood tempra, rice balls and Inari(Sushi rice wrapped in fried tofu ). 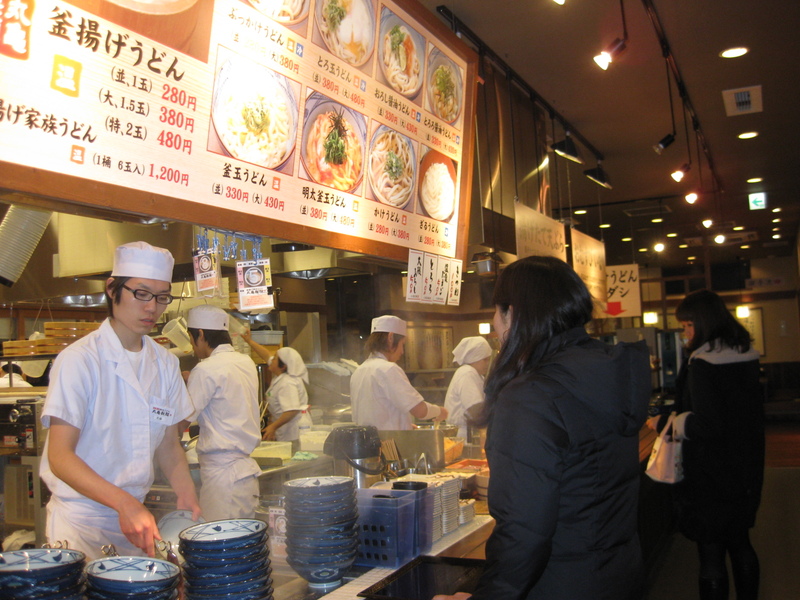 The lowest Udon price is 280yen, and most optional food are 100 yen/pcs. 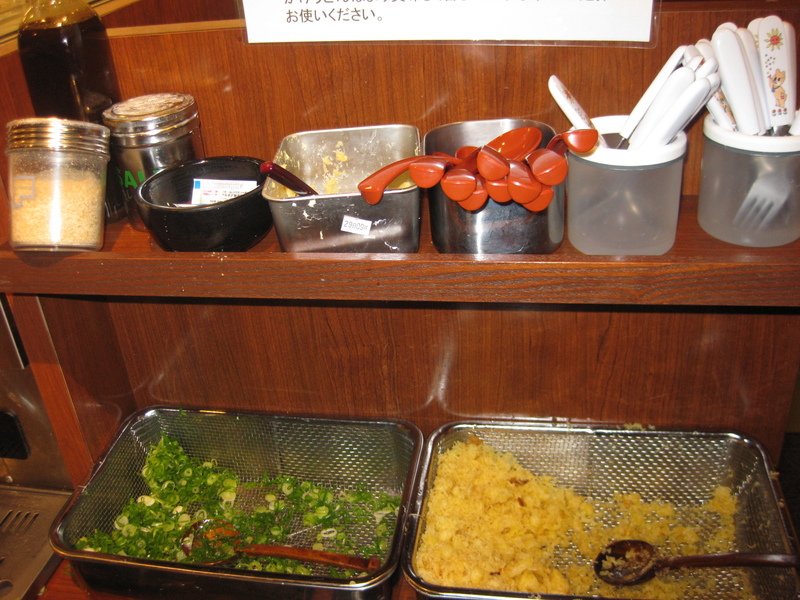 Toppings, Seasoning and Chinese Spoons "Help Yourself"
Here is my Udon Dinner – 480yen! I wanted to take other food pictures for foreign readers who might be scared of chinese yam or squid, but a staff told me not to take too many pictures. I didn’t quite understand why, but had to keep it on the down low anyway. It was tasty. Personally I felt the noodles were boiled too long. It might have a slight change by who would be boiling the noodles, so I think I have to go there again for the second try. 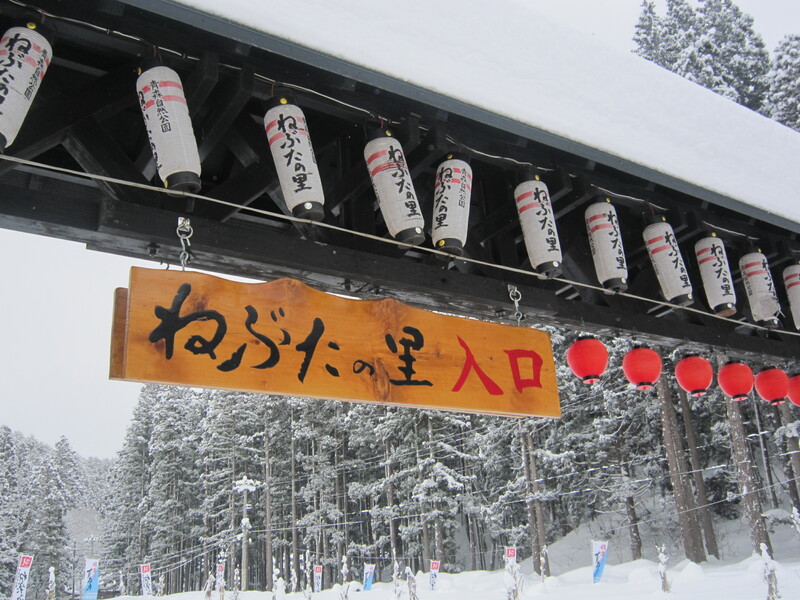 If you want to learn how to order in this kind of self service Sanuki Udon places in Japanese, you could look up the Kagawa-ken pages of “Japan” guide book published by Lonely Planet. 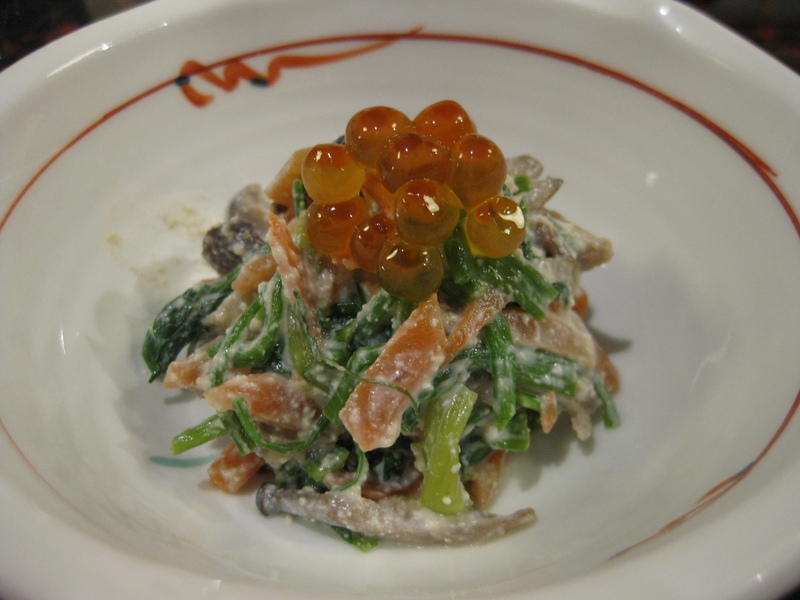 It has the great explanations and instructions about Sanuki Udon. 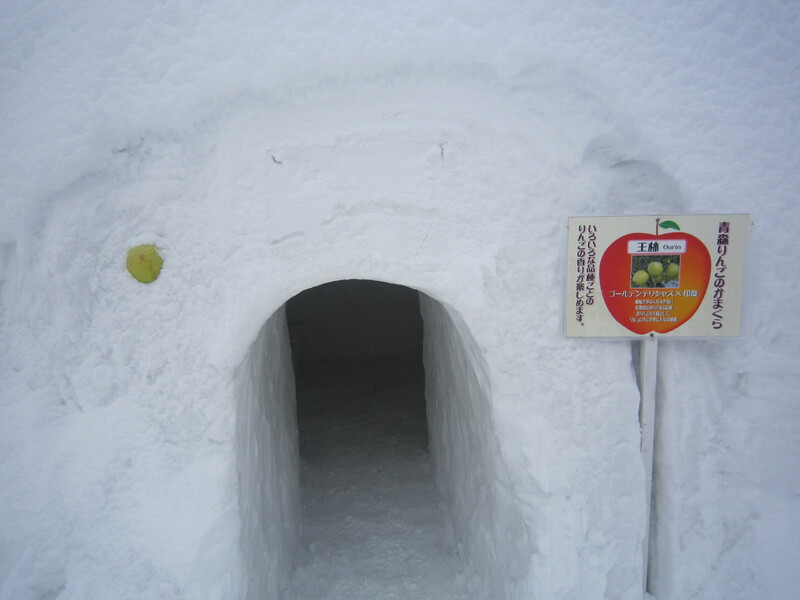 Winter has come around again…and it’s time to discuss a popular word in Aomori: snow. 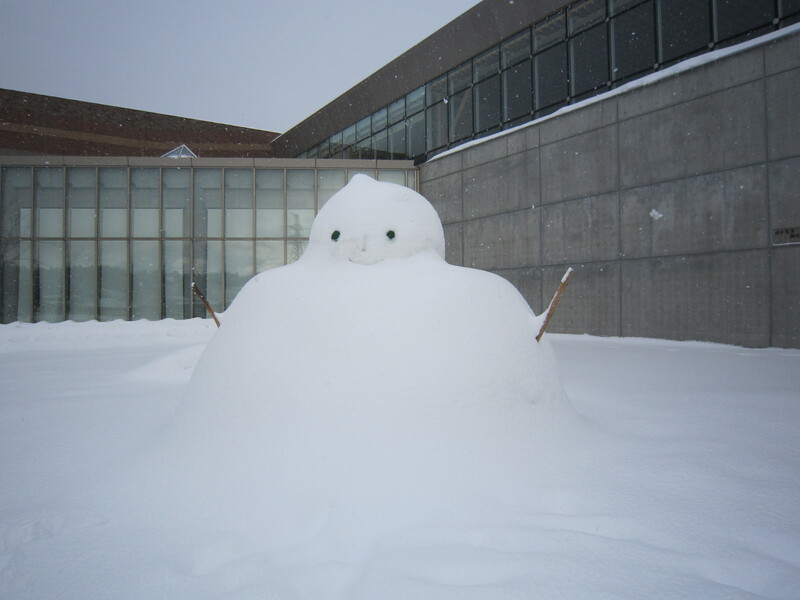 Yup, that’s right, I’m sure as you have heard, Aomori City gets a lot of snow. And when we say a lot, we mean a lot! With nearly 20 feet of snow annually, most mornings are spent shoveling snow just to get out of your house to the road. 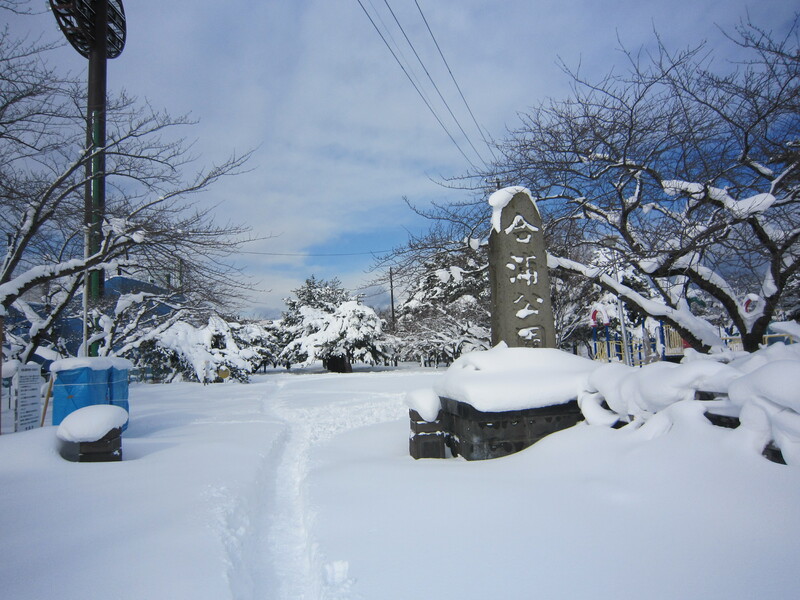 While Aomori City sees quite a bit of snow over the winter months, other areas around the prefecture including Hachinohe and Misawa see a much colder winter with significantly less precipitation. 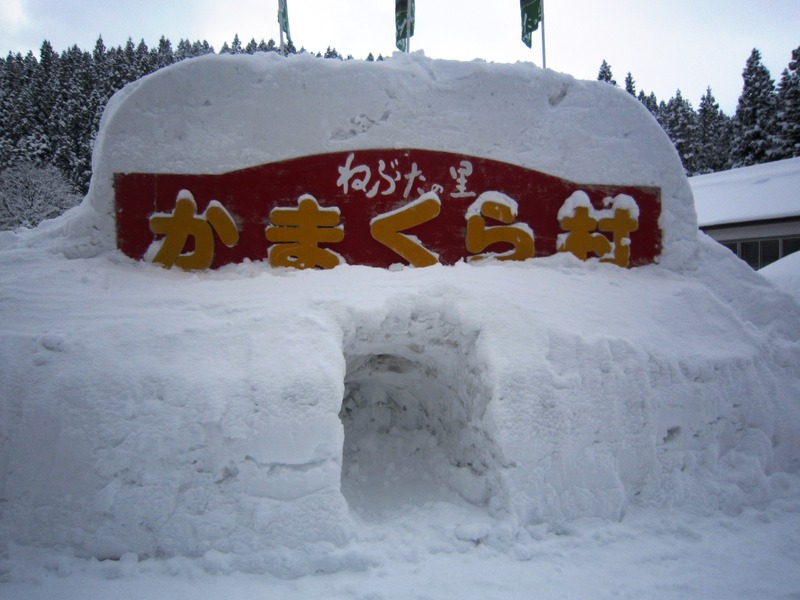 I was driving past Sannai-maruyama (a Jomon ruins site) last weekend and noticed a friendly sign of winter.